Asus needs no introduction as Asus has been a prime manufacturer of enthusiast grade components for the PC Gamers. Their ROG (Republic of Gamers) branding has done them some magic with what customers perceive this brand to be. From ever-popular motherboard and graphics card manufacturers, Asus has entered in the product line of Smart Phones, Notebooks, Chassis, Monitors, and now CPU Coolers. They have recently showcased two of their prototype coolers during the Computex 2018 held in Taiwan. Since its establishment in 1989, Asus has seen rapid growth in the market all over the world and with their continuous innovation and Research & Development, they have become the top preferred brand for the gamers. 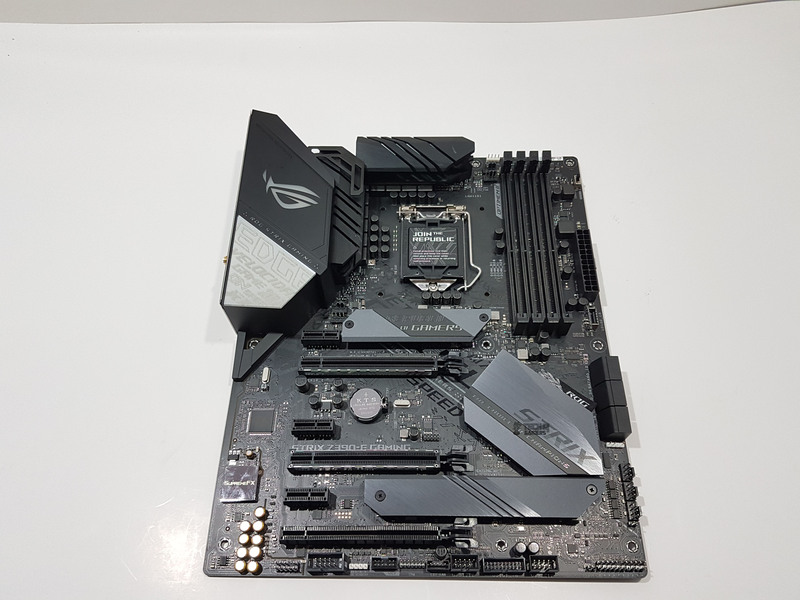 In this content, I will be taking a look at the Asus Strix Z390-E Gaming motherboard. As the name indicates, this motherboard is based on Intel’s new chipset aka Z390 which is sort of rebadged Z370. Intel has released a new generation of Core processors in the 9th generation which is still using 300 chipset series. The 8th and 9th generations are inter-compatible using the Intel LGA-1151 socket. Many have wondered why there was a need for new chipset when 9th generation core processors can be used on the 8th generation chipset after all the socket is same. 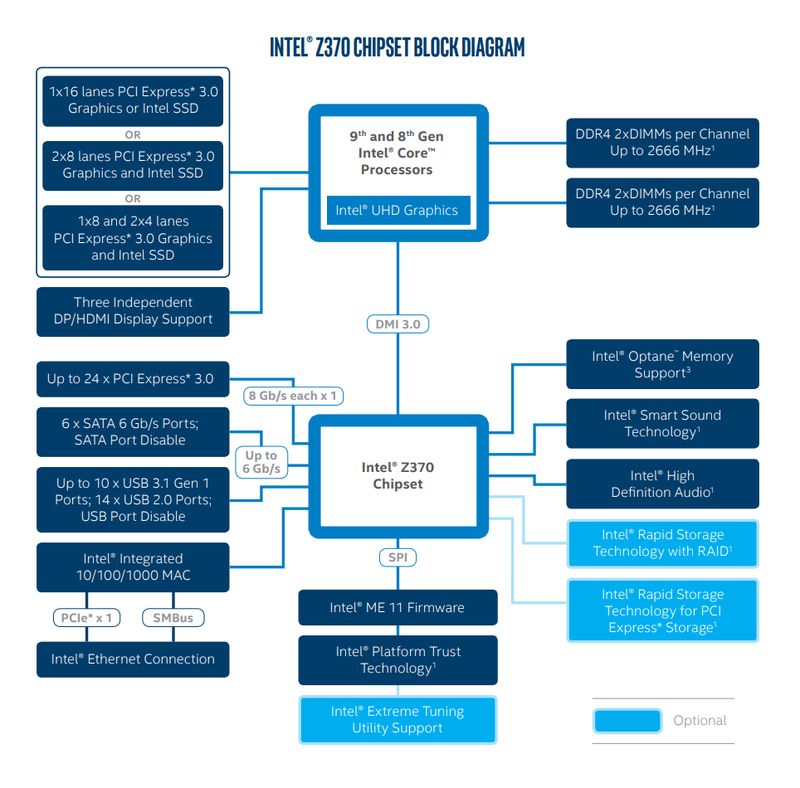 Intel has packed more cores on the same die and has soldered the PCB with the HIS though it has minimal effect on the thermal characteristics on the new chips and enthusiasts are already delidding their chips for better thermal depending upon the overclocking headroom. We are not suggesting deliding your chip as it will void the warranty. Do so at your own risk, please. Intel has changed the pins definition in the CPU socket which suggests why kabylake series CPUs can’t be used on almost the identical LGA-1151 socket. With 9th generation, Intel has released their i9 series of CPUs which are 8 core 16 threads with hyperthreading and boast turbo boost of 5.0GHz. 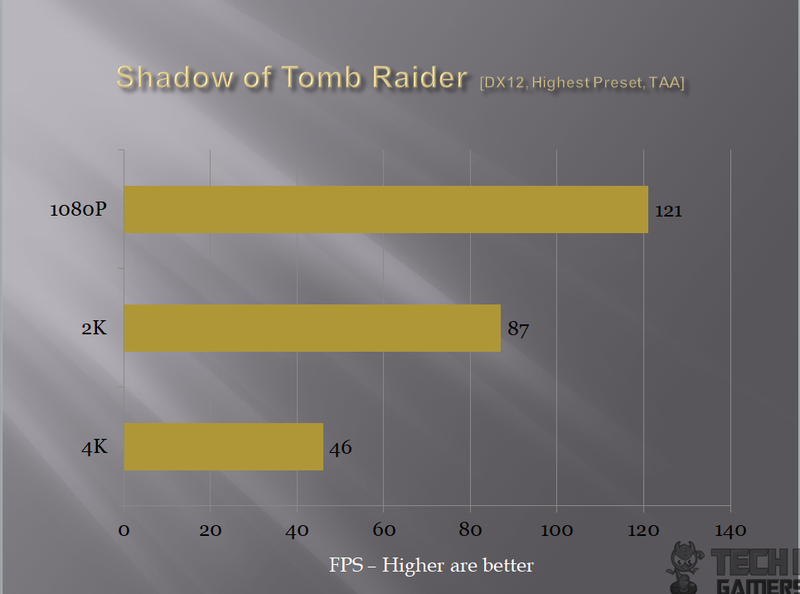 This clearly gives a hint of what Intel has been aiming at. Using the same die, packing more cores yet with higher clocks is what would summarize it in a nutshell. 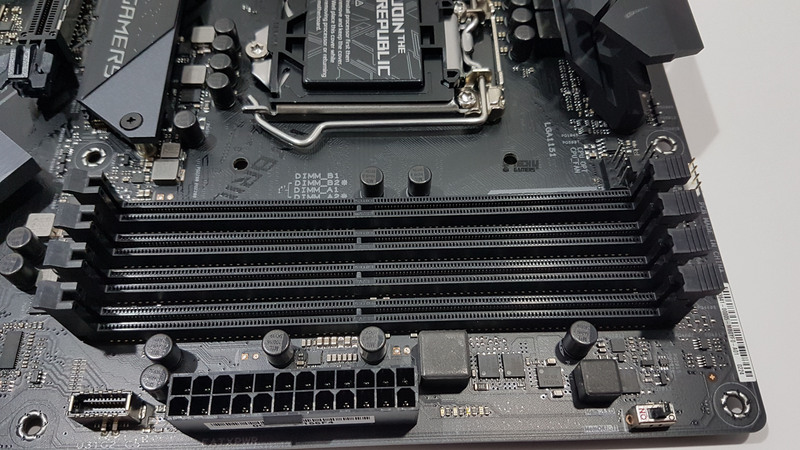 There are three major differences between the Z370 and Z390 chipsets, which are the Z390 chipset packs 6 USB 3.1 (10Gbps) ports which were not available in Z370 and integrated WiFi 80.2.11 ac on the Z390 chipset which was not a feature set on the Z370. The last difference is that Intel is using ME firmware version 12 on the Z390 chipset. Keep in mind that integration of WiFi in the chipset would mean an added cost that could have been optional! Just saying. Anyhow, the below picture shows the block diagram of the Z390 chipset. 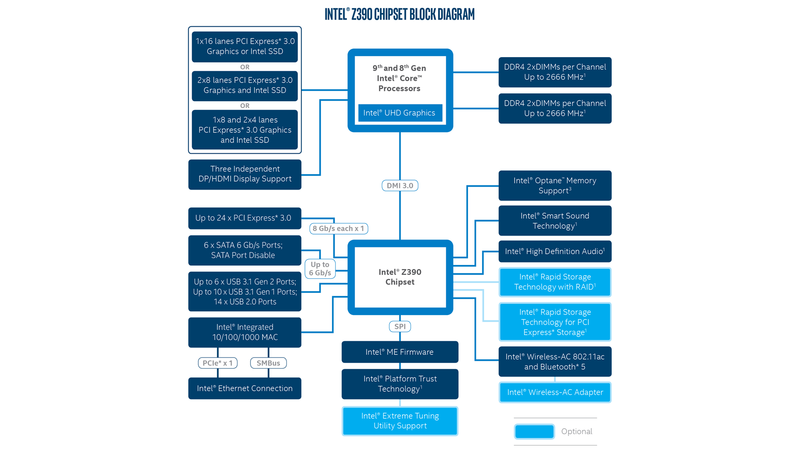 Below is the block diagram of the Z370 chipset. As can be seen, nothing is changed on the CPU socket. We have same support for the DDR4 modules and possible PCIe configurations coming from the socket. In the chipset, reading from the right side, we could notice the last two blocks indicating the Intel Wireless-AC 802.11 ac and Bluetooth 5.0. the light blue blocks are optional. Though it is not printed Intel is using ME Firmware Version 12 on the Z390. 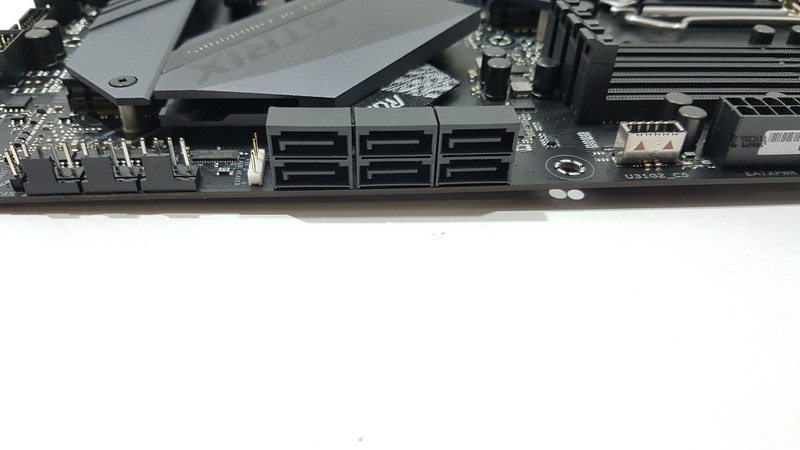 Looking at the left side of the blocks, the only change is the additional integration of the 6 high-speed USB 3.1 Gen 2 ports which now the Z390 chipset handles natively. 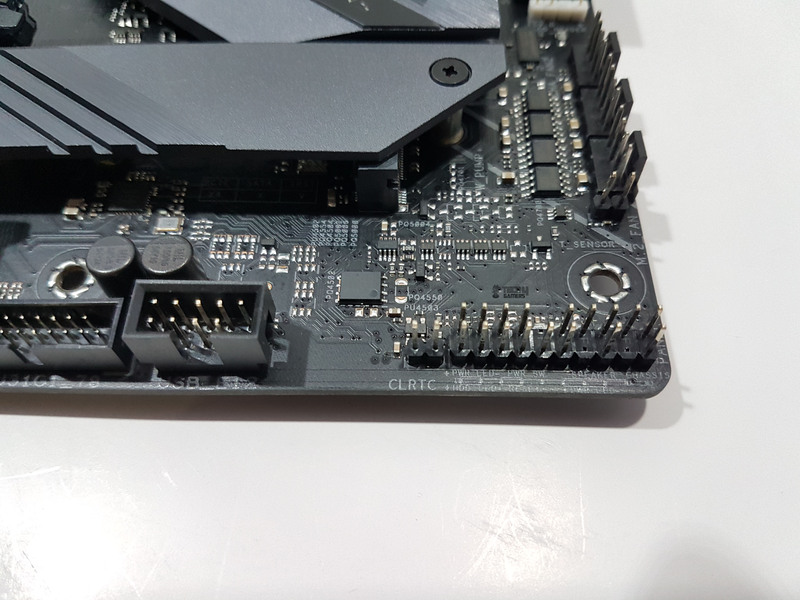 These ports are not present in the Z370 chipset. Z390 is not the only chipset but as has been the case there are other chipsets as well in the 390 series. 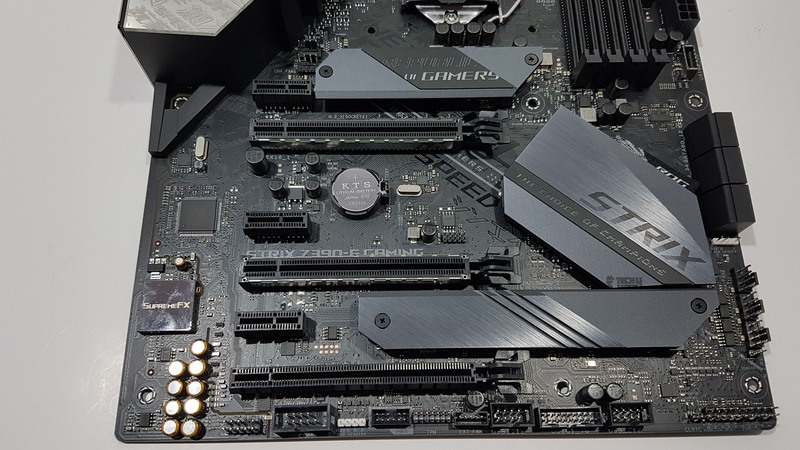 Now that I have mentioned the basic differences between the chipsets, let’s return to the main topic of consideration here which is the Asus flagship motherboard in the Strix lineup. 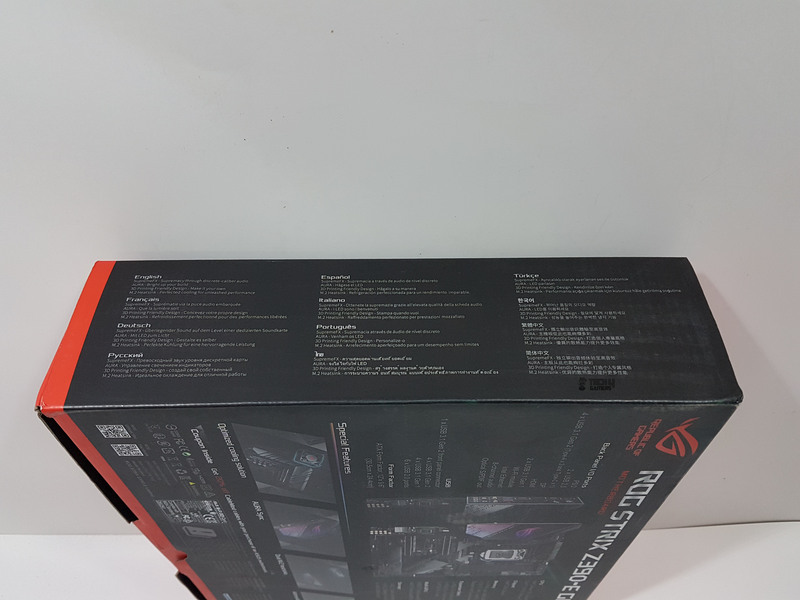 The enthusiast line of their motherboards is covered in ROG branding which starts at ROG Hero motherboard and goes as high as to the ROG Extreme motherboard. 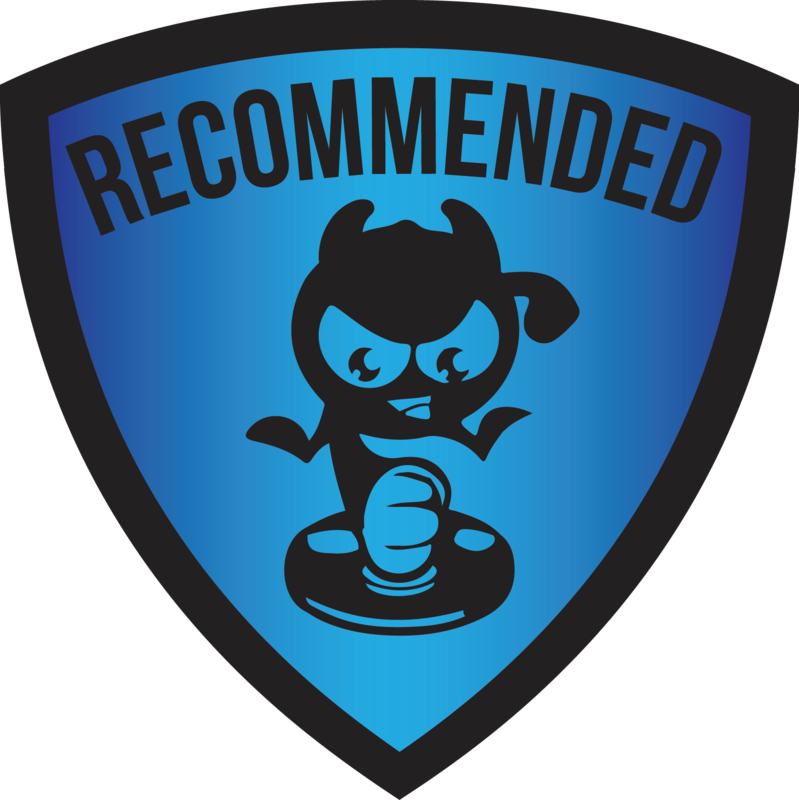 Obviously, pricing is the critical factor here which is Strix, Prime and TUF series exist as well to bring to the masses almost the same functionality and bit of fewer features yet with stellar looks and affordable pricing. 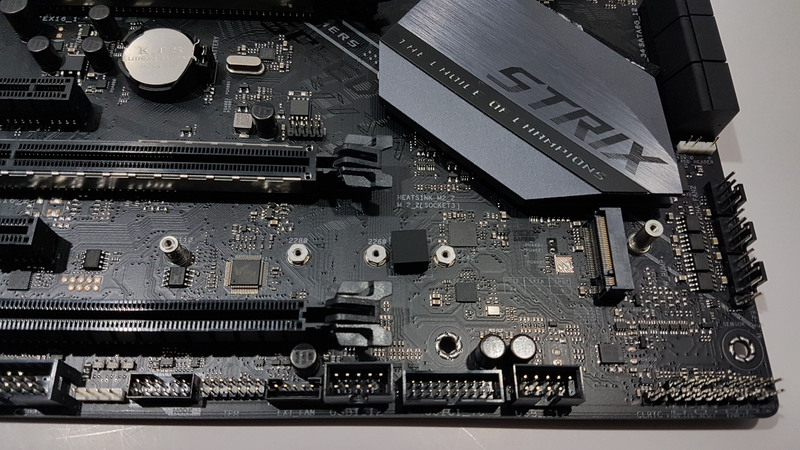 The Strix Z390E Gaming motherboard has almost everything that a user could ask for. It packs LGA1151 socket for 9th/ 8th Gen Intel® Core™ desktop processors, Aura Sync RGB to synchronize LED lighting with a vast portfolio of compatible PC gear, including addressable RGB strips. 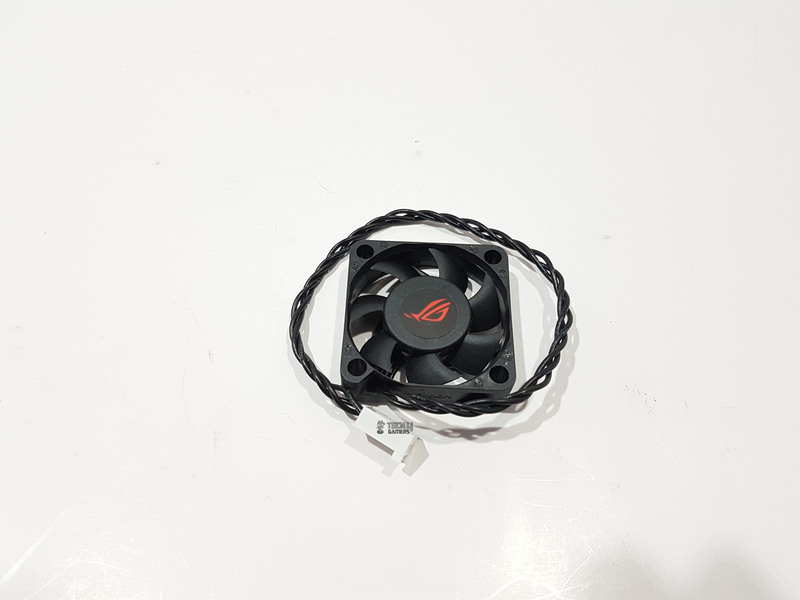 It has a comprehensive cooling provision in the form of dual onboard M.2 heatsink, water-pump header, fan-extension header and a MOS fan with bracket. 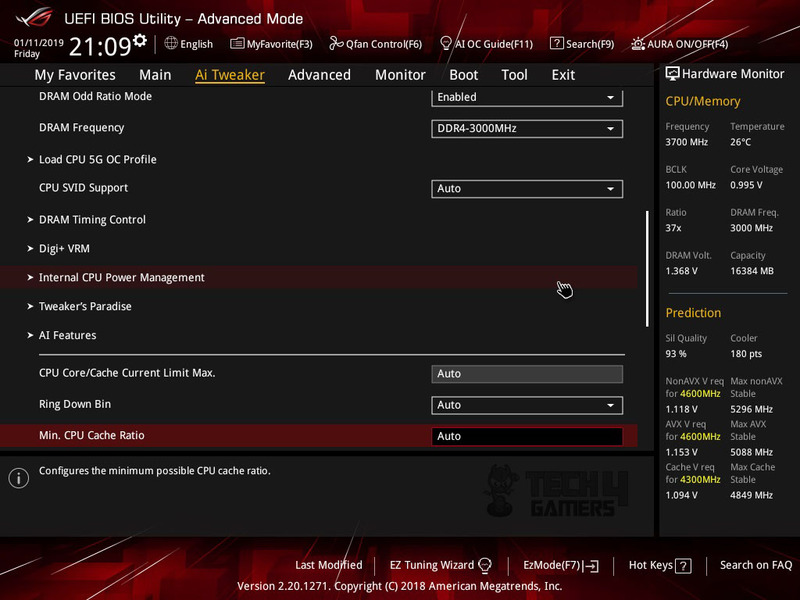 As a typical hallmark of the Asus motherboards design, this board is no exception as it has 5-Way Optimization enabled either through UEFI BIOS or the AiSuite software which encompasses automated system-wide tuning, providing AI overclocking and cooling profiles tailor-made for the build. In terms of the storage options we have dual M.2 and USB 3.1 Gen 2 Type-A and Type-C connectors and from Gaming networking perspective it has Intel Gigabit Ethernet, Intel 2×2 802.11ac Wi-Fi with MU-MIMO support, LANGuard and GameFirst applications to harness the power of the hardware. This motherboard is using SupremeFX S1220A with Sonic Studio III to create an aural landscape that draws you deeper into the action. The I/O shield is premounted which we are now seeing a common feature on the Asus motherboards. This motherboard has much more to offer than I could write here so let us not wait and dig deep into the design elements. The motherboard is shipped inside the cardboard box packing in the red/black color. 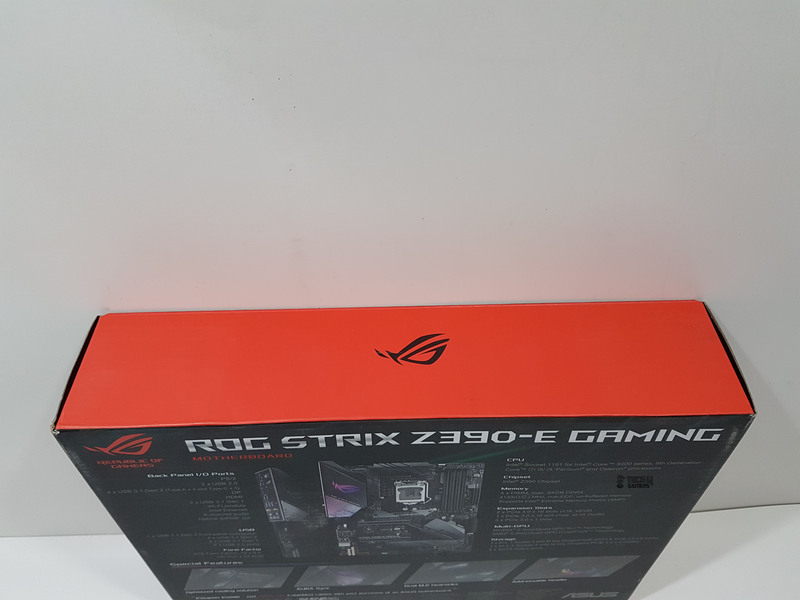 The front side of the box has ROG eye and branding printed in the red color on the top left. 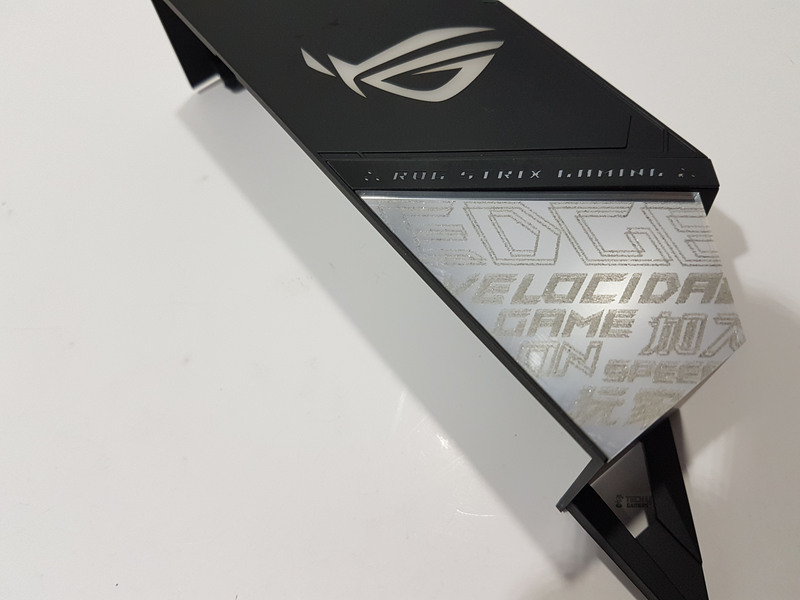 ROG Strix is printed in the silver color which reflects the lighting. Z390-E Gaming is printed in the white color. There is a picture of the motherboard on the right side. Salient features highlights are printed at the bottom right side like Intel Z390 chipset, Intel Optane Memory ready, Nvidia SLI and AMD Crossfire ready. 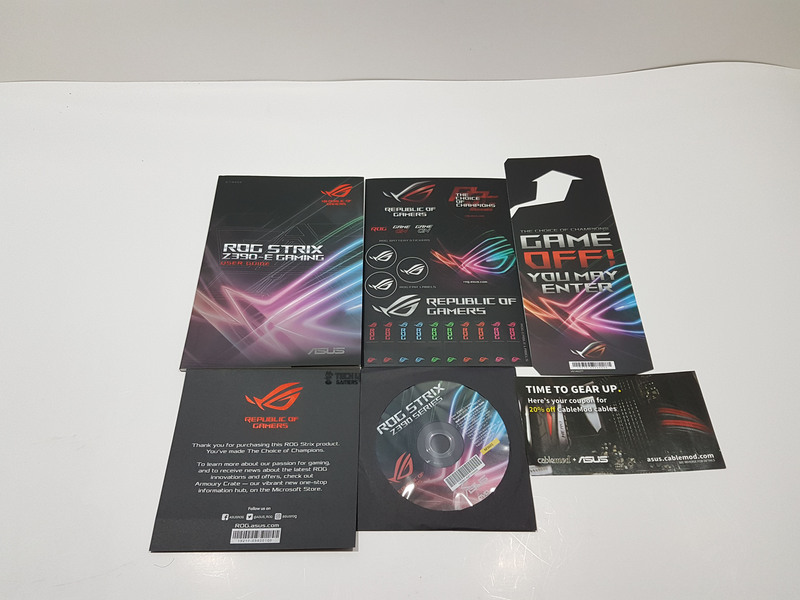 The backside of the packing box has ROG eye and branding printed on the top left. 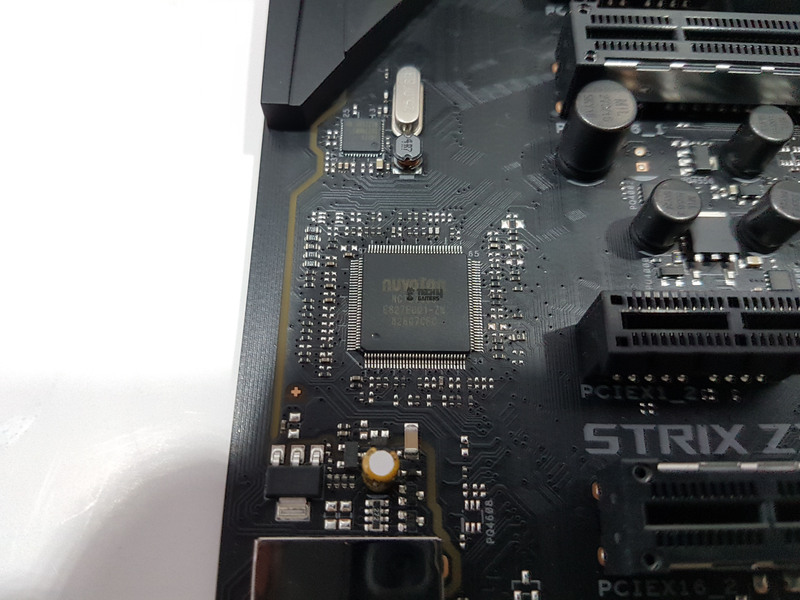 ROG Strix Z390-E Gaming Motherboard is printed next to the branding text. There is a labeled picture of the motherboard which is a nice way to mention the specifications of the board. Special features are highlighted using 4 actual pictures of the board like an optimized cooling solution, AURA Sync, Dual M.2 heatsinks, and addressable headers. And as usual, there is a 20% discount coupon from the CableMod inside the box. This motherboard comes in 3 years limited warranty. The left side of the box has Asus branding and model of the motherboard on it. The right side of the box has salient features printed in 12 different languages. The top side has a solid red color background with reflective black color ROG eye in the middle. 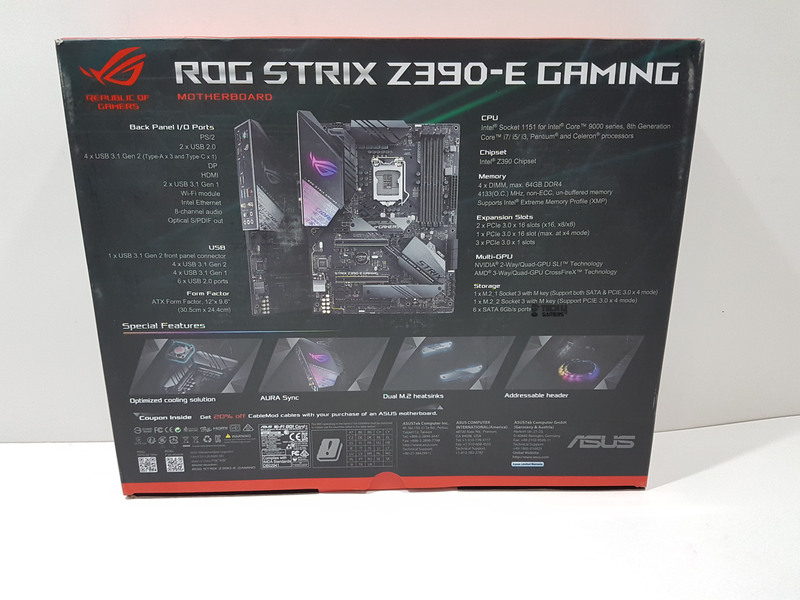 The opening side of the box has a red color background as well with Asus branding printed on the left side followed by the model of the board. There is a large size-sticker pasted on the right side showing the serial no, part no, UPC, EAN and check no info labels. Opening the box will show the motherboard placed inside the anti-static container and another cardboard box which is welcoming the user to the Republic of Gamers. The WiFi antenna is placed inside this box. Removing this box will show the motherboard completely. Taking the motherboard out will show the rest of the contents. It is time to take a closer look at the motherboard. This motherboard has a standard ATX size PCB (12”x9.6”) which is in black color. The wires traces are beautifully designed on the PCB as they are visible and add to the overall aesthetics and beauty of the board. This time they have added written textures as well on the PCB and they do look cool in person. This motherboard seems to be using 4+2 phase design with doublers giving the users 8+2 phase design (not solid 8 phase design) but I am not sure about that. Let’s start with the top side of the PCB. 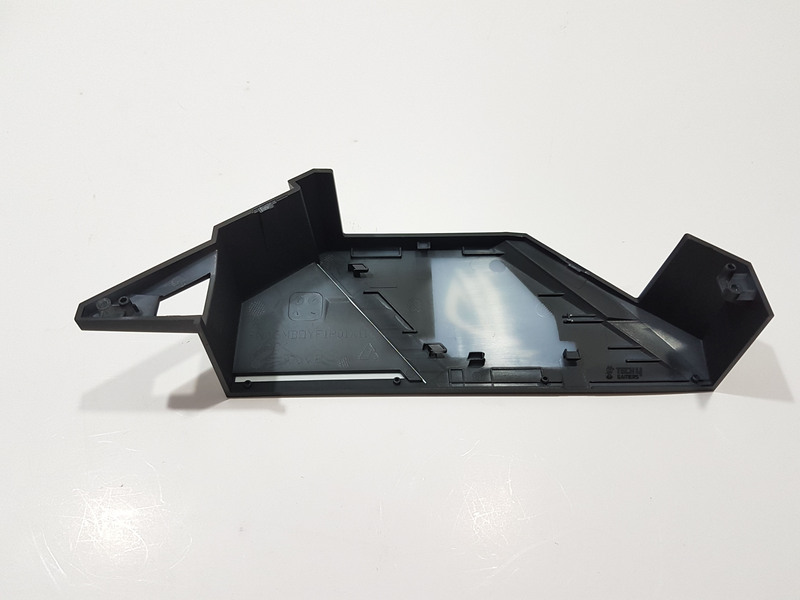 There is a plastic made cover or shroud on the I/O shield side with two distinct features. One is the ROG eye logo on the black color side of the shroud which actually has diffuser underneath and lights up when powered on. By the way, it is RGB so you can guess what it can do when AURA comes online. Lighting effects can be synced which is needless to say. The bottom section of the shroud is where the real bold and stunning looks of the board is coming from. There is a futuristic cyber-text pattern which gives ROG Strix Z390-E Gaming a unique and arresting design that communicates its gaming identity. The cyber outlook extends to the PCB and heatsink with subtle textures that contribute a premium look and feel. Tearing the shroud would disclose the black color PCB underneath it with the RGB LEDs on it to illuminate the ROG eye. There are 12 RGB LEDs on the PCB. Please, note that these are not addressable RGB LEDs. The power cable is coming from the underside of the PCB is connected to the power header on the motherboard which is not visible unless the shroud is removed. Clearly, Asus design team was thinking straight in giving a clean looking board. The shroud is fixed using three small size screws. To take the shroud off, remove those screws from the backside of the motherboard. This will expose the rear I/O ports. 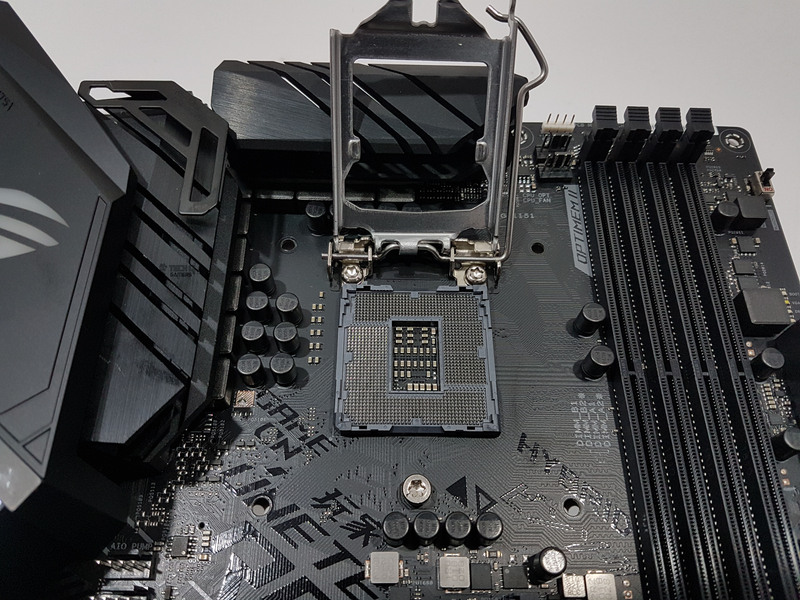 Take care while removing the shroud if so required as it has RGB cable connected to the header on the motherboard’s PCB. Gently remove the connector from the header and this would completely remove the shroud off the PCB. There are two boldly design aluminum heatsinks covering the VRM and MOSFETs on this board. They use thick gray color thermal pads. Each heatsink is attached using two screws. These can be removed from the backside of the motherboard. Each heatsink is stylishly designed and coming from a single piece of aluminum. 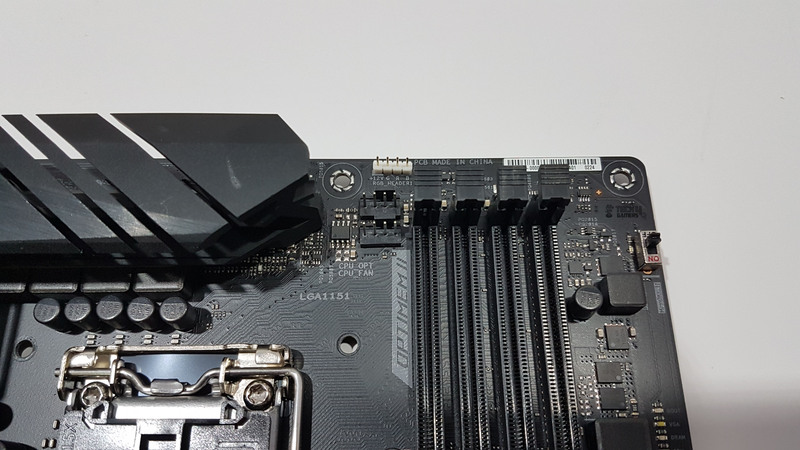 In case you are wondering what is the small bracket on the top of the left side heatsink is for, Asus has provided an active cooling solution should the user need one for the VRMs/MOSFETs. There is a 40mm fan that is provided in the accessories. 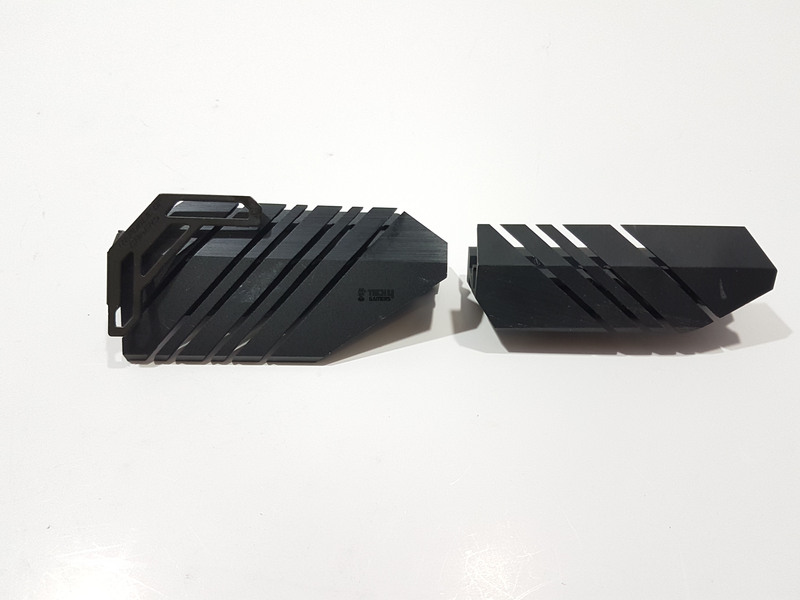 It can be connected to the bracket to provide adequate cooling for the VRM and MOSFETs. The fan has a dimension of 40x40x10mm. This fan has 7 blades and is made in China. There are no anti-vibration rubber pads on the mounting corner. A little digging on the internet reveals that it is made by the Sunon with product series of MagLev. It is DC Brushless type fan rated at 12VDC having rated speed of 5800RPM±10%. Current rating is 40mA with a maximum current of 48mA. It has rated the power of 0.59W. The airflow rating is 7 CFM. The sound level is rated at 20.6 dBA and it is using VAPO bearings. It has 3-pin power connector in the white color. The length of the cable is approximately 190mm. This fan when powered on produces a whining noise. Asus has customized it with the ROG eye sticker pasted on the motor hub. The part no is MF40101V2-10000-G99. This board features the Intel LGA-1151 socket. Don’t be confused with the socket type as you can’t use Skylake/Kabylake based CPUs on the 9th generation motherboards. Though the no of pins is same but their specific definition is not. The CPU socket area is well designed with clearance in mind for large CPU coolers. Foxcon LGA115X is printed on the CPU socket cover. Important instructions are printed on the top of socket cover. This cover needs to be placed somewhere safe after installing the CPU. As a general rule of thumb, always keep CPU socket covered. Taking a look at the topmost section of the PCB, we have a CPU overvoltage jumper. It is a 3-pin jumper and it is disabled by default. To gain more CPU voltage setting, insert eh jumper to pins 2 and 3. Next, there is an 8-pin EATX12V connector or commonly known as CPU power header/EPS connector. There is nothing particular on the right side of the connector and the next thing that we would see after the top heatsink is 4-pin AURA Sync header. It has +12V GRB pin format. The RGB header supports 5050 RGB multi-color LED strips with a maximum power rating of 3A at 12V and no longer than 3m. This is not an addressable header. 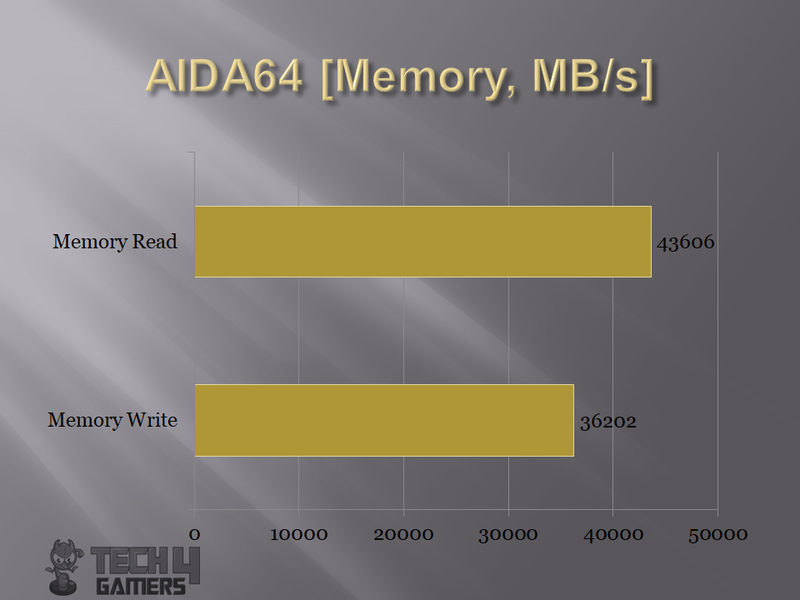 Down the road, we have 4 DIMM slots for DDR4 type memory only. Their one side has fixed latches whereas the other sides have flexible latches. Asus is using the Q terminology on their motherboards like Q-DIMMs, Q-LED Debug etc. We have 12mm of spacing between the DIMM and the CPU socket area. This is calculated from the mounting holes on the socket area. 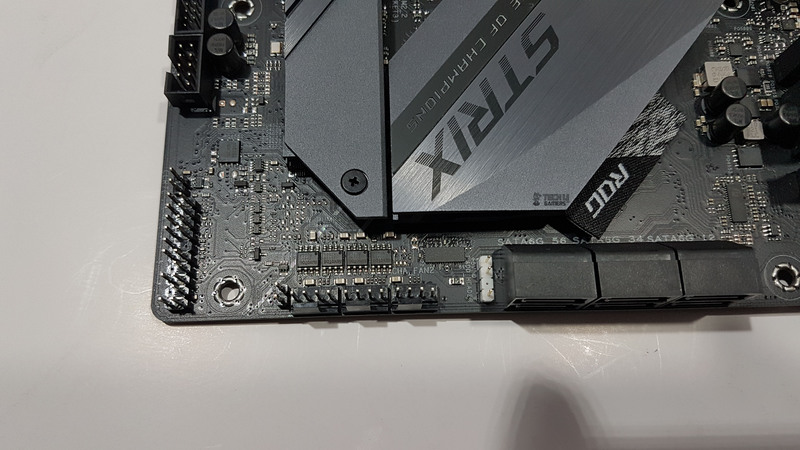 To install a RAM, release/push the flexible latch outwards outwards, align the pins on the RAM with the DIMM slot’s mounting area and insert the RAM into it, this will automatically pull the flexible latch to snap on the RAM and you will hear a nice clicking sound confirming that latch has locked on the RAM. To remove the RAM, simply push that latch away from the RAM and pull out the RAM. Maximum of 4 DIMMs can be installed at a time with a maximum capacity of 64 GB. These are DDR4 type with 288 pins. DDR4 speed is 2133/2400/2666MHz as per JEDEC specification. Maximum supported speed on this motherboard is 4266 (OC). 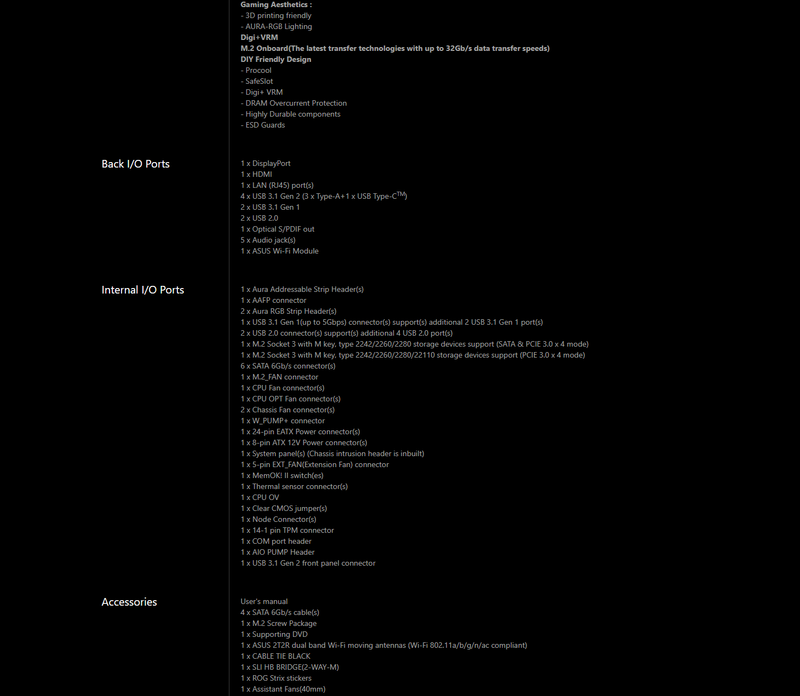 Other supported speeds are already mentioned in the specification section of the review. Memory type is Non-ECC, un-buffered with Dual Channel architecture. It supports Intel® Extreme Memory Profile (XMP). In case you are installing a single module, insert it into DIMM_A2 or the rightmost DIMM. For two modules, use the DIMM_B2 and DIMM_A2 slots. In other words, use the second and the fourth slot from the CPU socket. Adding all 4 modules needs no explanation. 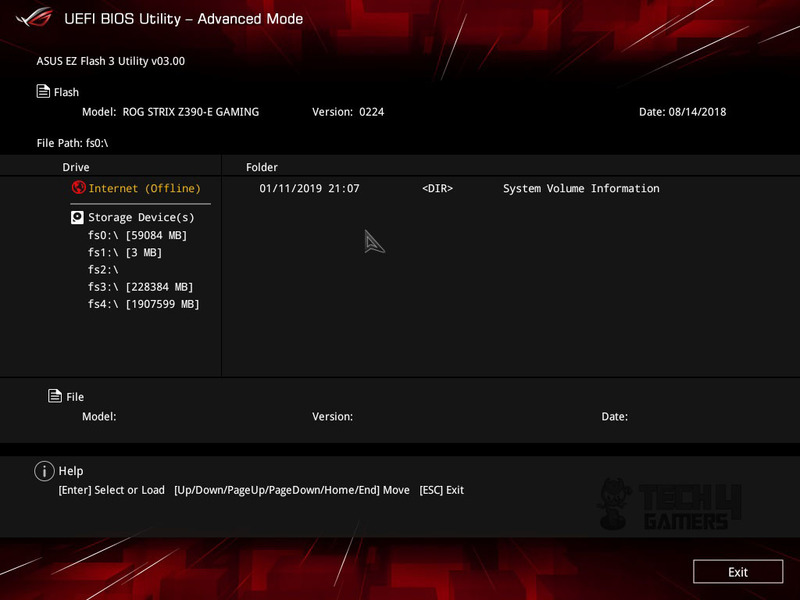 A latest BIOS update has enabled 128GB of DRAM support on the Asus Z390 motherboards. On the left side of the DIMM slots, we have two 4-pin fan headers. 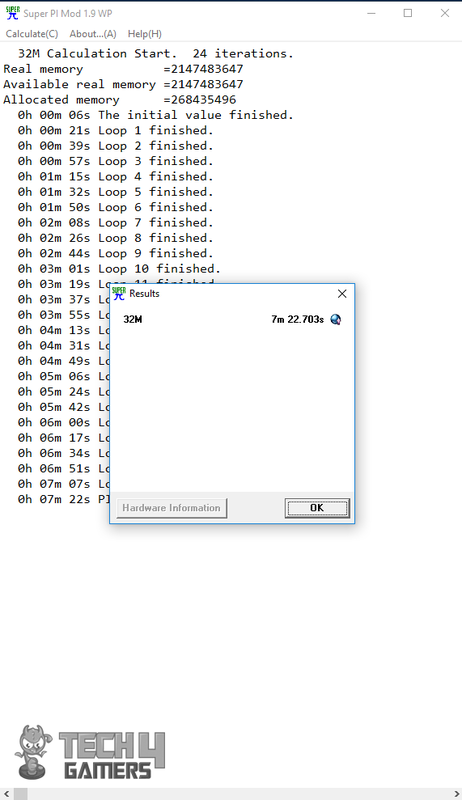 The top one is the CPU_OPT fan header whereas the bottom one is the CPU_Fan header. OptimemII is printed on the right side of these headers. To provide Intel’s latest CPUs unfettered access to memory bandwidth, motherboard trace routing has been reimagined with the ROG Strix Z390-E Gaming. Integrated OptiMem II technology carefully maps memory signal pathways across PCB layers to reduce vias, and it also adds shielding zones that significantly reduce crosstalk. To further enhance overclocking headroom for fully stacked memory configurations, a highly customized T-Topology layout delivers time-aligned signaling. On the right side of the DIMM slots, we have a MemOk button. It is enabled by default. It is there to re-train the memory in case any un-supportive or incompatible memory is installed which may cause system boot failure. The Mem_LED will light up while re-training and will turn off when it is completed. Next, we have are 4 Q_LEDs. Starting from the top we have Boot LED, VGA LED, DRAM LED, and CPU LED. The boot LED is in a yellow-green color. The VGA LED is in white color. The DRAM LED is in yellow color. The CPU LED is in red color. These are POST state LEDs as they provide the status of their respective key components during POST. In the case of an issue/error, the corresponding LED will stay lit until the issue is resolved. This is a visual aid for the troubleshooting as this motherboard does not have Q-LED Debug. The 24-pin ATX power connector is below the Q_LEDs. Below this connector, we have a USB 3.1 Gen 2 front panel connector. Not all PC Chassis have support for this port at the moment but a few. With the release of more and more new chassis, it is expected to become a norm much like USB 2.0/3.0 ports that are a common feature on the chassis. The USB 3.1 Gen 2 allows up to 10Gbps transfer rate and it is compatible backward. 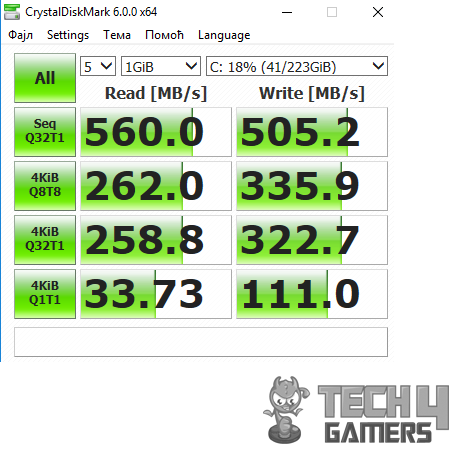 Below the USB 3.1 Gen 2 connector, we have 6 SATA ports which are 6Gb/s rated. RAID 0, 1, 5, and 10 configurations are possible from the Intel Z390 chipset using Intel Rapid Storage Technology. These ports are numbered from 1 to 6 where the top port right next to the USB 3.1 Gen 2 connector being the port no 1 and its bottom port being no 2. These ports are by default set to AHCI mode in the BIOS. The user can change that in the BIOS. For SATA disk drives, leave that mode as it is, if not creating RAID. This motherboard is Intel Optane Memory ready. Below the SATA connectors, we have AURA Sync Addressable header. It is rated at +5V and has +5,D,,G pin format. This header supports WS2812B addressable RGB LED strips with a maximum power rating of 3A (5V) and a maximum no of 120 LEDs. This connector is followed by the CHA_FAN2, W_PUMP+, and M.2_FAN headers. These headers except the W_PUMP+ are rated at 1A each and have 4-pin PWM interface. The W_PUMP+ header is rated at 3A for the provision of 36W of power to the power hungry pumps of a custom loop. Next is the 2-pin thermal sensor connector for which thermistor has been provided in the accessory. 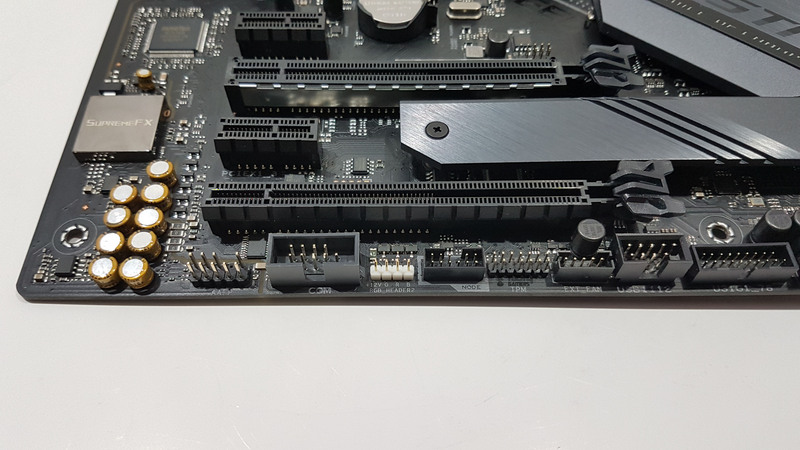 Let’s take a look at the bottom section of the motherboard and see what connectivity options are there on it. Starting from the right side the first connector is the 20-3 pin system panel connector. 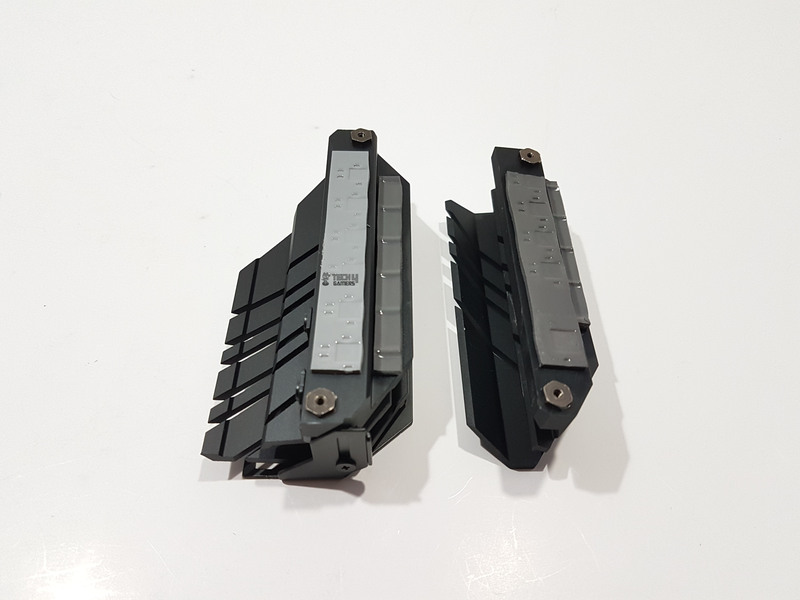 This connector supports Chassis mounted function like powering up the system, resetting it, Power LED indicator, storage LED indicator etc. On its immediate left side, there is a CLRTC jumper. Since this motherboard does not have dedicated Clear CMOS button on the I/O shield, they have used the old school way of providing this feature. The user can power off the system and using any metal like a screwdriver the real-time clock in CMOS RAM can be cleared by touching both pins of the jumper at the same time for 5-10 seconds. There is a gap and then we have a 9-pin USB 2.0 header rated at 480 MB/s. Next, we have a 20-1 pin USB 3.1 Gen 1 connector. On its left side, we have a second 9-pin USB 2.0 connector. Next, we have 5-Pin Fan Extension connector. 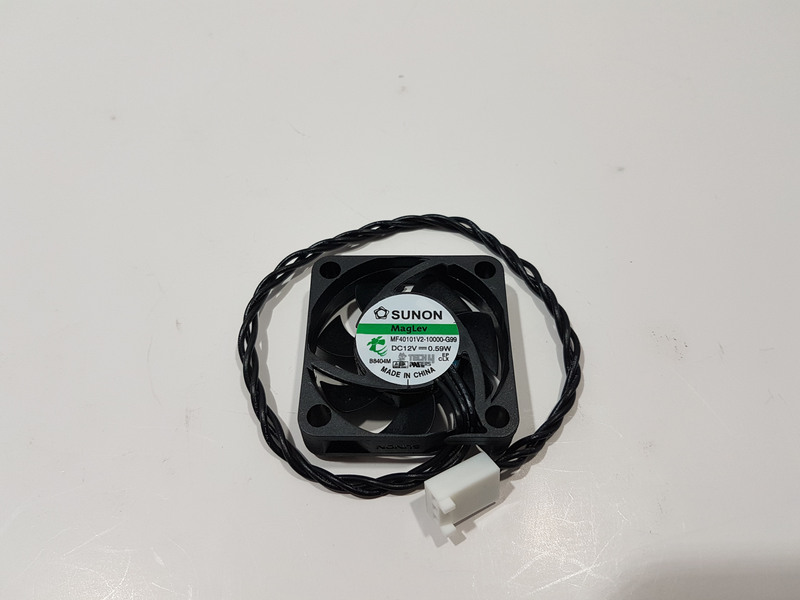 Should a user needs to connect and control more fans in the system, an optional Fan Extension accessory can be purchased which will allow to connect up to 3 PWM fans and 2 thermal sensors in addition to what is already on the motherboard. I love this idea from Asus though that would mean more cables to deal with and to properly mount the fan extension hub somewhere in the chassis. This hub has SATA connector to power it up. Next, is a TPM connector (14-1 pin). TPM stands for Trusted Platform Module which securely stores keys, digital certificates, passwords and data which is helpful in enhanced security, system integrity, protecting digital identities etc. Next up is the new connector called Node. Asus has recently released their THOR series of PSUs. They bear a stylish and bold lookout and they are solid units as Seasonic is the OEM of these units. 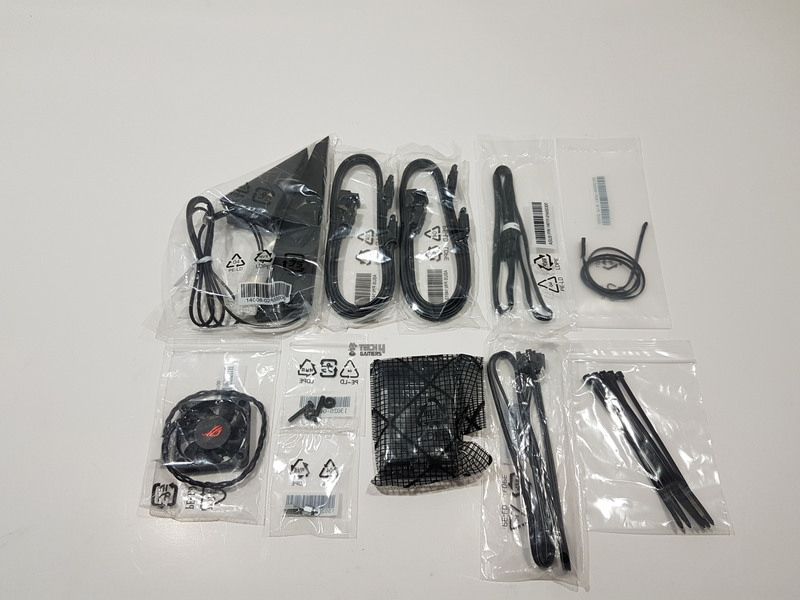 Asus has provided a way to connect these PSUs to the Asus motherboards using the Node connector. Next up is the second AURA header based on +12V GRB format. All this lighting comes under AURA umbrella. As the name indicates, this technology has everything to do with the lighting on the board; not just lighting but RGB goodness. Shroud on the back I/O ports has LEDs on the diffuser. Asus has provided software to control all the lighting effects. Users now can connect their LED strips specially designed for these headers with the motherboard and can have all the lighting of the chassis coordinated with the motherboard’s lighting effect. CableMod has designed many such strips for the AURA headers. 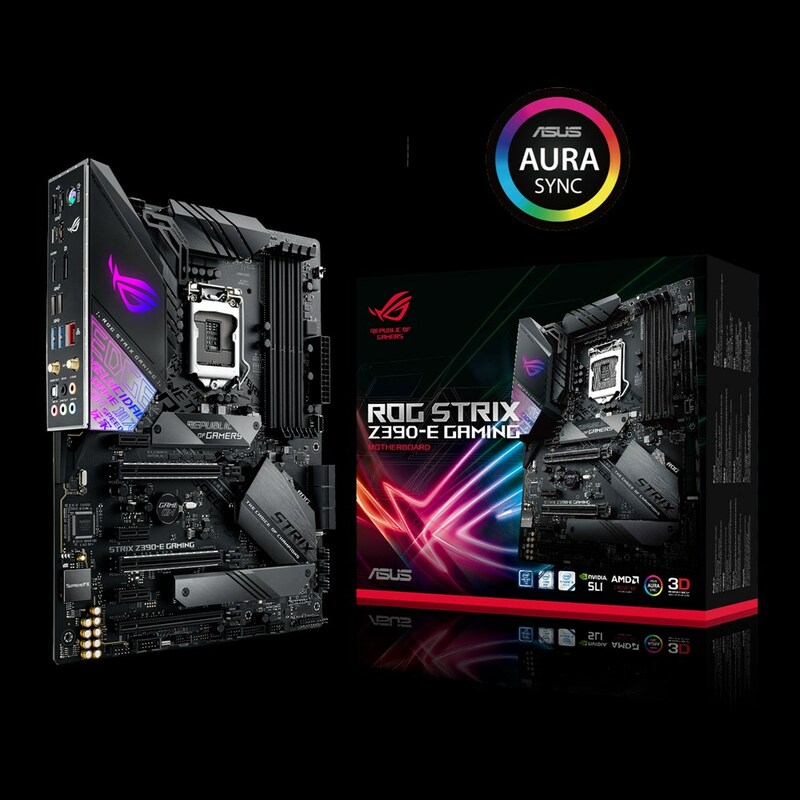 Asus has introduced the AURA Sync in which all components like the motherboard, the graphics cards, the peripherals, and the LED strips can be synced and color coordinated. Next, is 10-1 pin Com connector. Connect the serial port module cable to this connector if using any. Backward compatibility is always welcome. Next is 10-1 AAFP front panel audio connector. This connector is for the chassis-mounted front panel audio ports with HD Audio. Let’s take a look at the M.2 storage options on this motherboard. One M.2 socket is located right below the CPU socket facing the first PCIe slot. It is referred to as M.2_1 and it supports PCIe 3.0 x4 and SATA mode M key design and type 2242/2260/2280 PCIe storage devices. The second M.2 socket is right under the Chipset cover. This cover is actually a heatsink cover and can be taken off by removing 3 screws. Taking it off will show the socket (socket 3). This socket is referred to as M.2_1 and it supports PCIe 3.0 x4 M Key design and type 2242/2260/2280/22110 PCIe storage devices. Both of these sockets support Intel Rapid Storage Technology (IRST). A protocol support table is printed right on the PCB for this socket. Both M.2 sockets have beautifully designed heatsink covers with thermal pads pasted underside of the heatsink. The other side of the pad is covered with a protective sheet which user can take off before mounting the heatsink onto the M.2 device. There is no LED underneath to light it up. Let’s take a look at the PCIe slots. 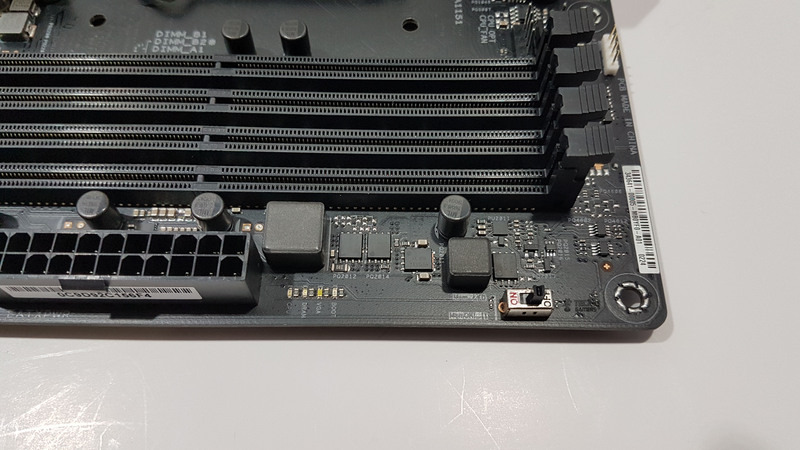 This board has total 7 PCIe slots. Slots no 1, 3, and 5 from the top are PCIe Gen 3.0/2.0 x1. The second slot is PCIe Gen 3.0/2.0 x16. This slot is electrically x16 implemented and connected with the CPU. This is an only slot with x16 speed on the board. The fourth slot is PCIe Gen 3.0/2.0 x8. The sixth slot is sharing bandwidth with last two SATA6G ports and it is set at x2 by default. Please note that in the case of two way SLI or CF-X, slot no 2 and 4 will operate at x8/x8 speeds. 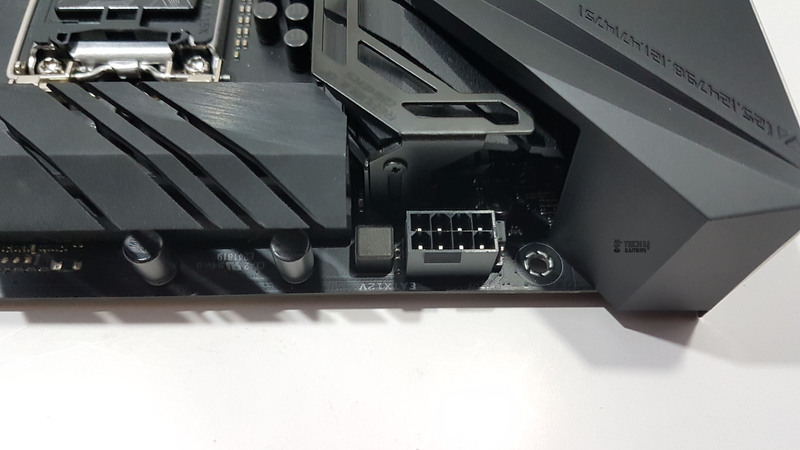 There is a CMOS battery right below the second PCIe slot. 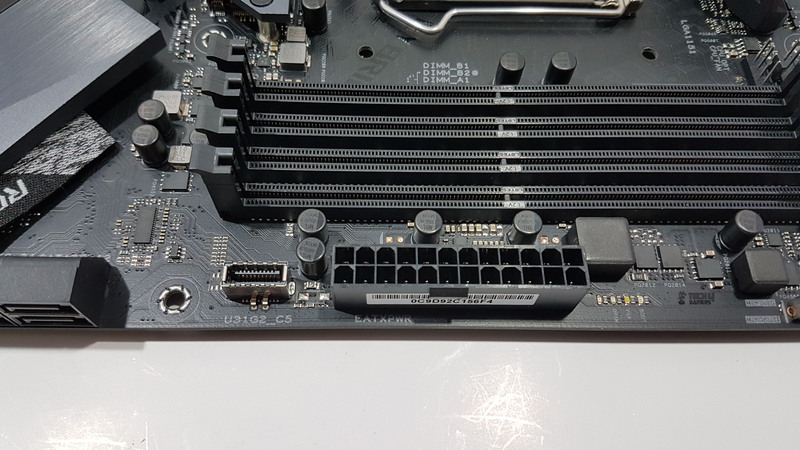 The second and fourth PCIe slots are Safeslots. Featuring a new single step, insert molding, manufacturing process that integrates fortifying metal and additional solder points, Safeslot provides stronger PCIe device retention (1.6X) and greater shearing resistance (1.8X). Now, it is time to look at the Audio solution on this board. 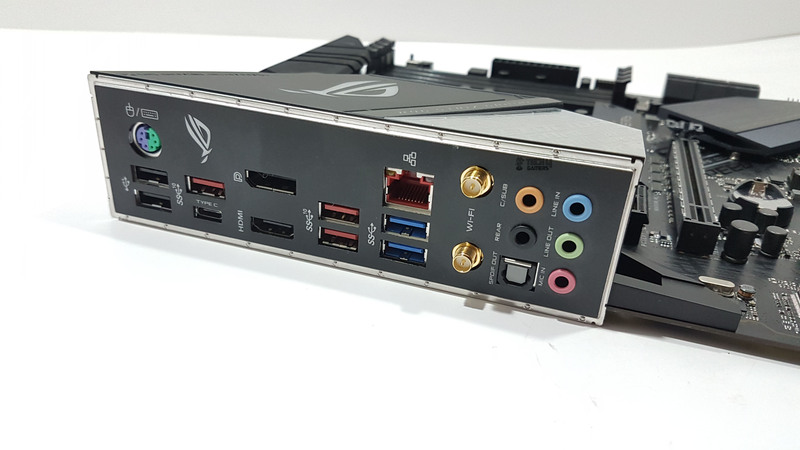 SupremeFX is the name of the onboard Audio solution from the Asus on their ROG Strix line up of the motherboards. 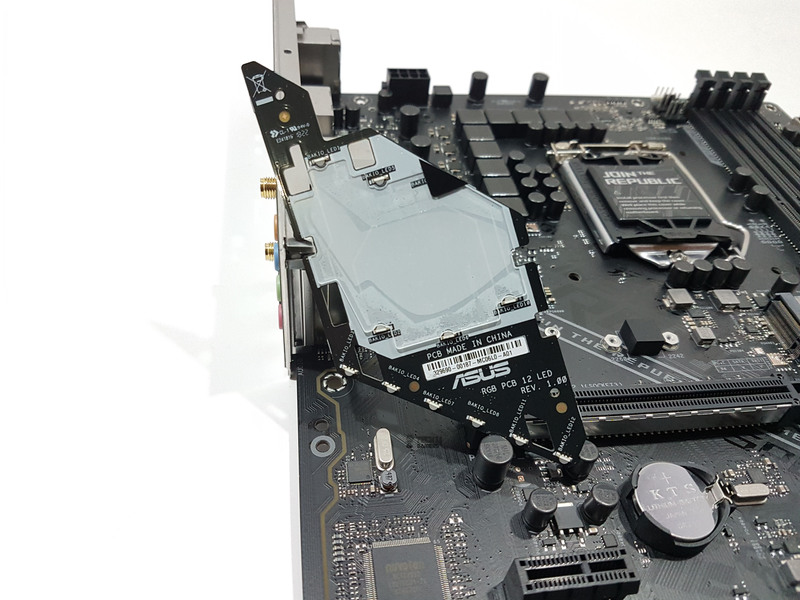 Asus has added a low-dropout regulator for cleaner power delivery to the SupremeFX S1220A codec, an ESS® Sabre Hi-Fi ES9023P digital-to-analog converter for superior front-panel output, and a Texas Instruments® RC4580 and Opa 1688 op-amps for high gain with low distortion — which all adds up to audio that envelops you as never before. Using SupremeFX S1220A, we’ve 10 DAC Channels, simultaneous 7.1 channel playback, independent 2.0 channel, multiple-stream stereo to front-panel outputs. Delivering all this power are Nichicon capacitors with high precision clock source and switching MOSFETs. We’ve RC 4580 buffer which provides excellent voltage and current for perfect true-to-life tonality and sound imaging. Hardware is backed up by the comprehensive software suite in the form of Sonic Studio III and Sonic Radar III. These software allows the user to custom tailor the sound according to their needs with later software helps the users in identifying the position of the enemy while gaming. The Audio hardware has been implemented on the lower left side of the PCB and it has audio line shielding to block electromagnetic interference from the motherboard to provide a clean audio signal. Asus is using multiple layers on the PCB for the audio hardware. S1220A with the letter A designates Asus exclusive chip implementation and it has 113dB signal-to-noise ratio on the in-line connection and 120dB on the out-line connection. Asus ROG Strix Z370-E Gaming features the very latest Intel® Ethernet (I219-V) for faster, smoother gaming. Intel’s LAN has the serious double advantage of reducing CPU overhead and offering exceptionally high TCP and UDP throughput. Asus has implemented LANGaurd. This helps to ensure the safer, more reliable connections for your gaming sessions. Advanced signal-coupling technology and premium surface-mounting processes join forces to protect motherboard’s connection, plus electrostatically guarded and surge-protected components (ESD Guards) for 1.9x greater tolerance to static electricity and 2.5x greater protection (up to 15kV) against surges. 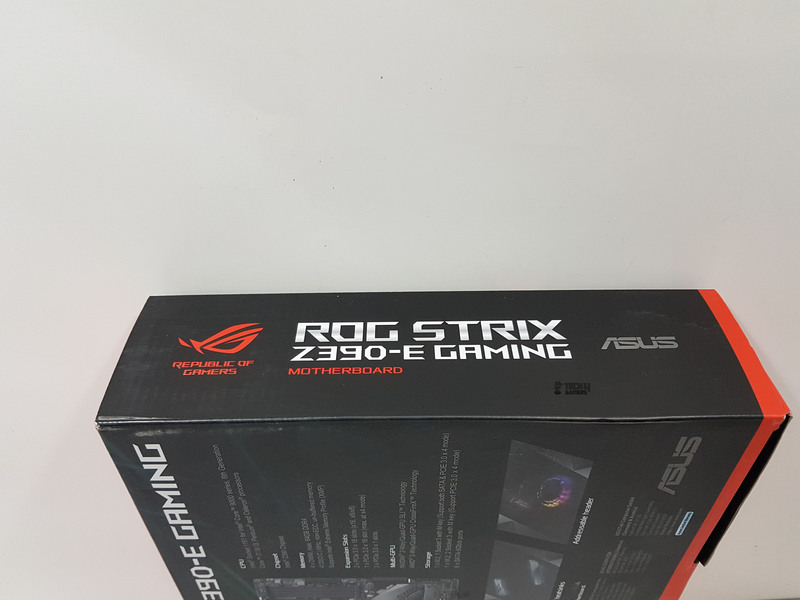 ROG Strix Z390-E Gaming features Intel 802.11ac Wi-Fi with 2×2 MU-MIMO and wide 160MHz channels, for wireless speeds of up to 1.73Gbps. Its integrated Wireless-AC 9560 Wi-Fi adapter pushes wireless data up to 2X faster than other Wi-Fi solutions — so you’ll get fast, smooth transfers, even when PC is further away from the router. Intel Wireless-AC 9560 also offers Bluetooth 5.0 for connections that are up to 2X faster than ever before and with up to 4X the range. Backing all this up is GameFirst V software which optimizes network traffic for faster, lag-free online gaming — and now it supports Multi-Gate Teaming to team up to 4 networks for maximum bandwidth and smooth gameplay. Intelligent mode automatically compiles a database by parsing new app data to ensure that every game is optimized for the best performance. 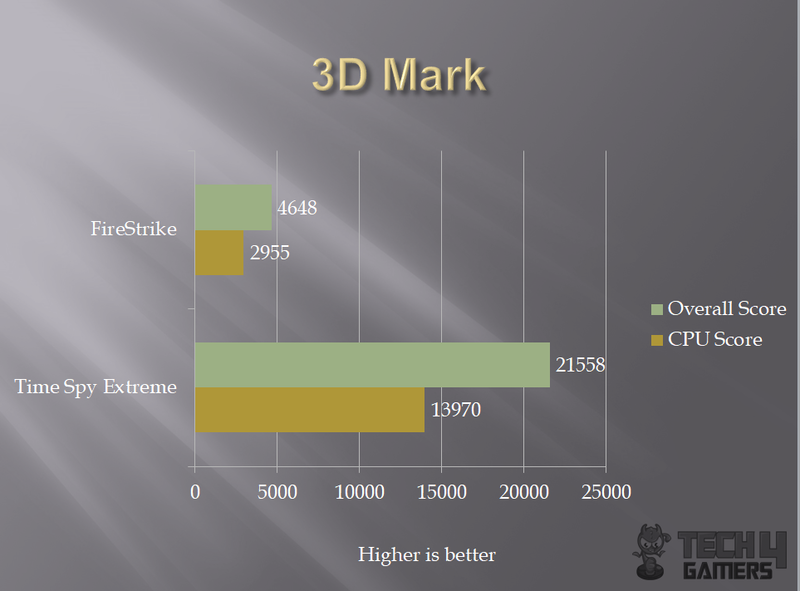 Before discussing the performance of the test build, let’s have a look at the BIOS of the Strix Z390-E Gaming. 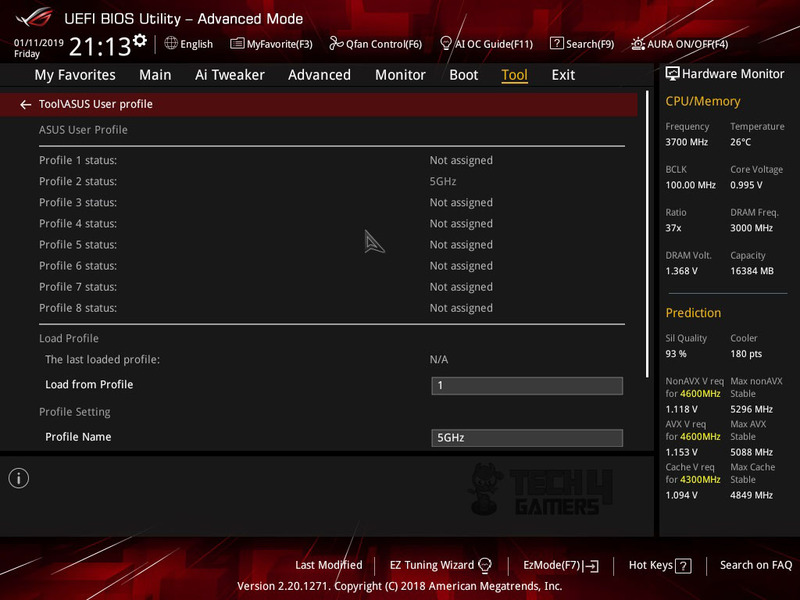 Asus has provided a ton of options in their media acclaimed UEFI BIOS. The graphical interface is easy to navigate through using the mouse and the keyboard. When loaded, EZ Mode will be enabled. This mode is for new users. For experienced users, pressing F7 would load Advanced Mode. 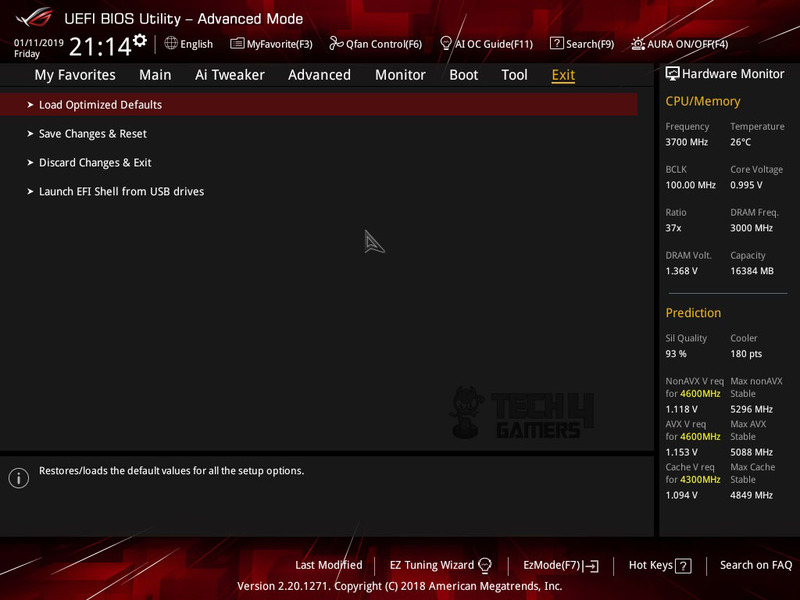 Extreme Tweaker Menu is loaded on the BIOS startup. 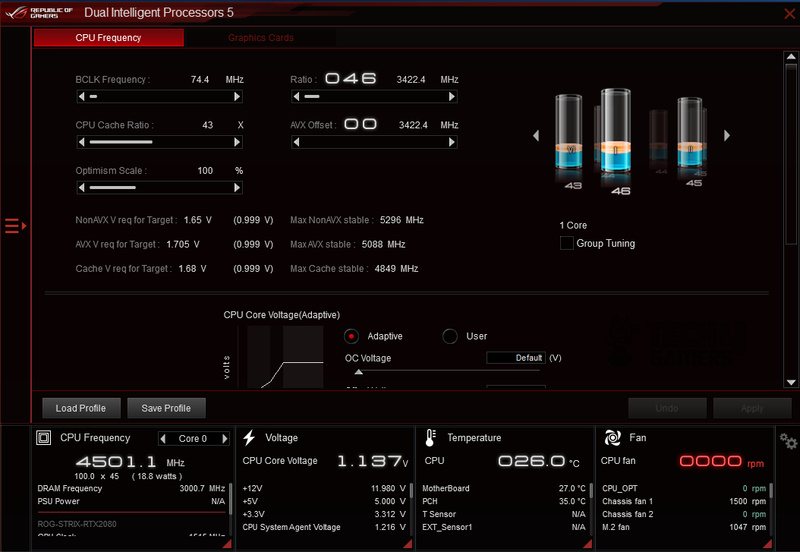 It shows the CPU and Memory related critical info like Temps, Clocks, Ratio etc on the right side. On the left side, we’ve to overclock related options. 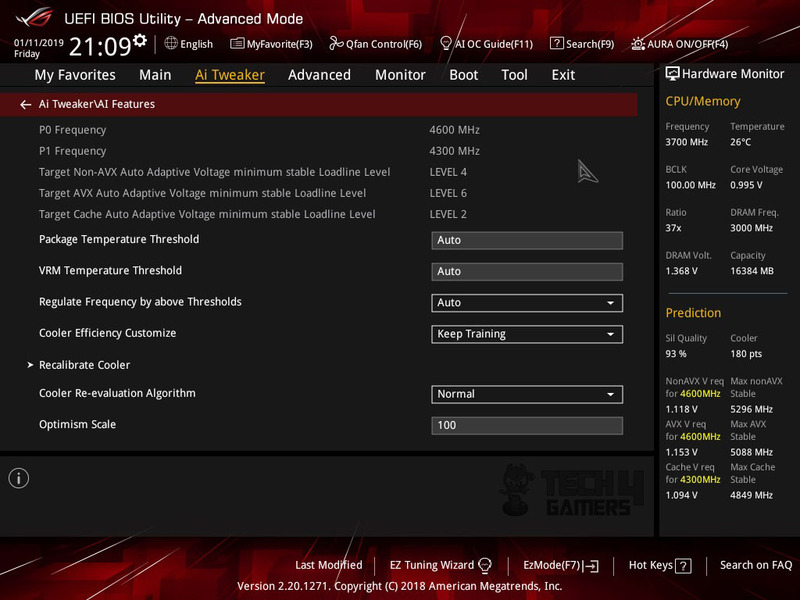 XMP can be loaded from the Ai Overclocker Tuner option. 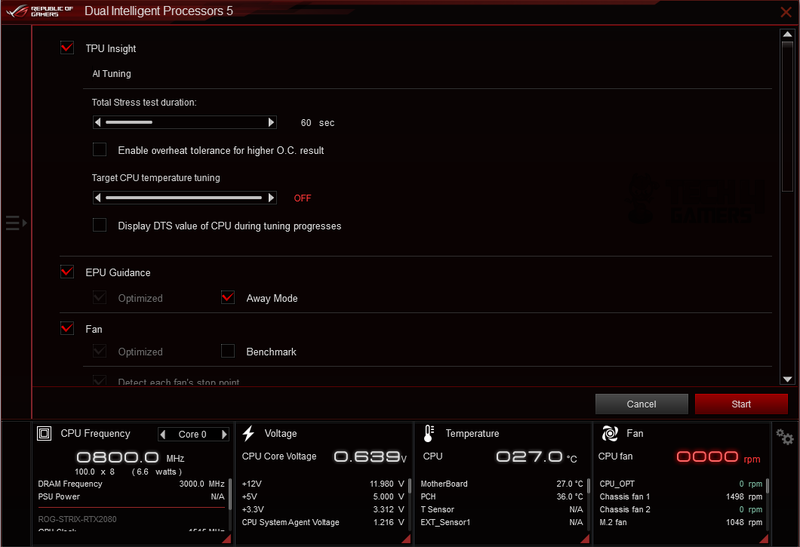 Asus has introduced a new feature called AI Overclocking which is their take on assisting the users with specially written codes which predict the Chip’s overclocking capability and the cooling solution’s effectiveness and tends to overclock the system to the tune of optimal parameters of both the silicon and the cooling solution in tandem to where possible. It also continuously re-train to assess the cooling potential. 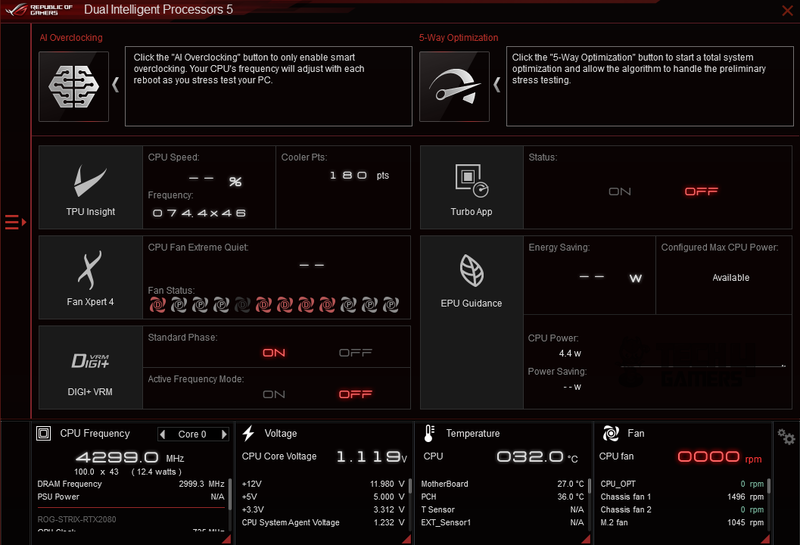 The bottom right side of the Extreme Tweaker Menu shows exactly the possibility coming out of the AI Overclocking. 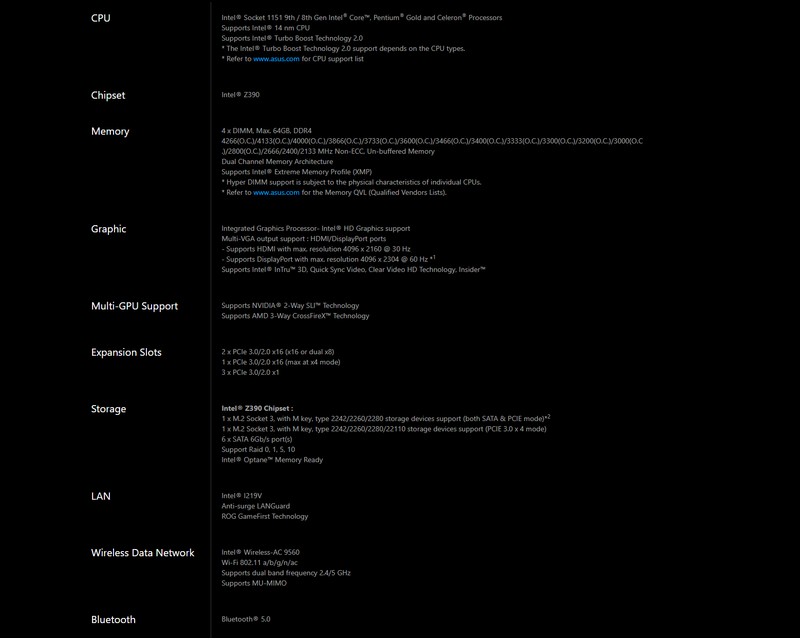 The main page is for information only showing the system date and time, BIOS version, CPU information etc. 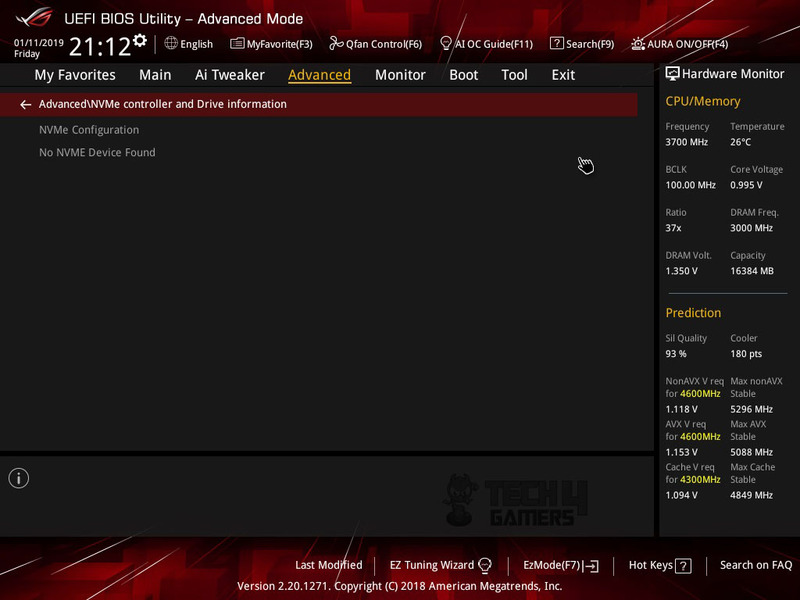 AiTweaker menu has all the CPU and Memory related settings and what not. 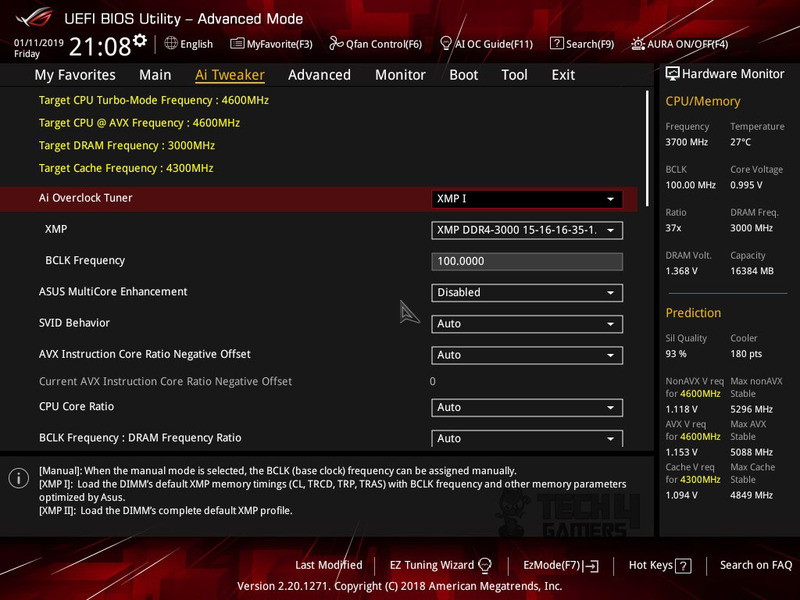 AiOverclock Tuner has Auto, Manual and XMP settings. 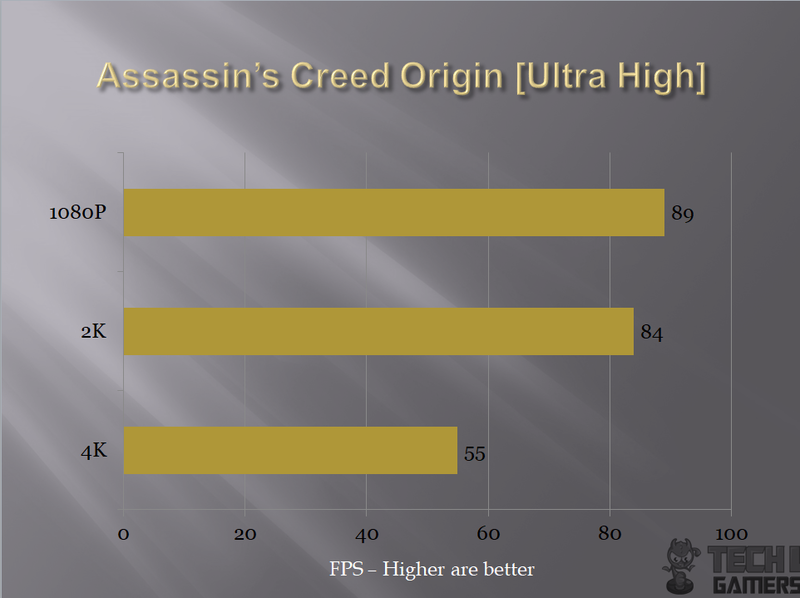 Experienced users will tend to use the manual option to better tune their overclocking attempts. 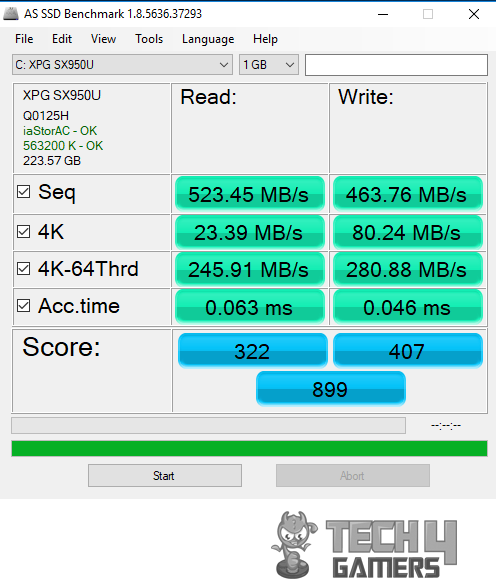 XMP will load the XMP profile of the connected DRAM for its effective speed. 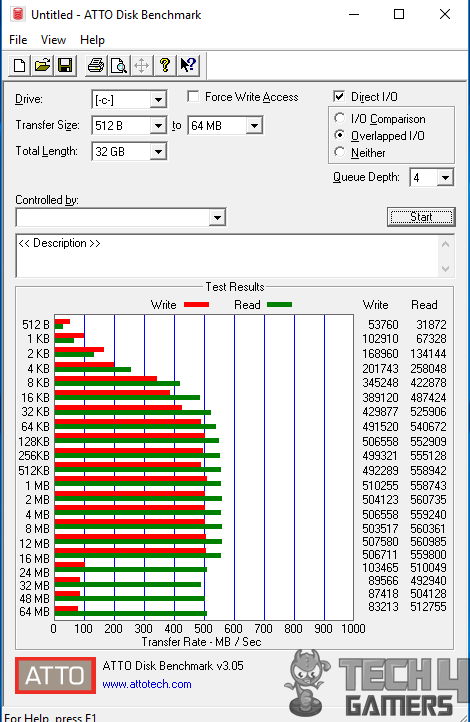 Once loaded, the XMP profile information will be visible against XMP. 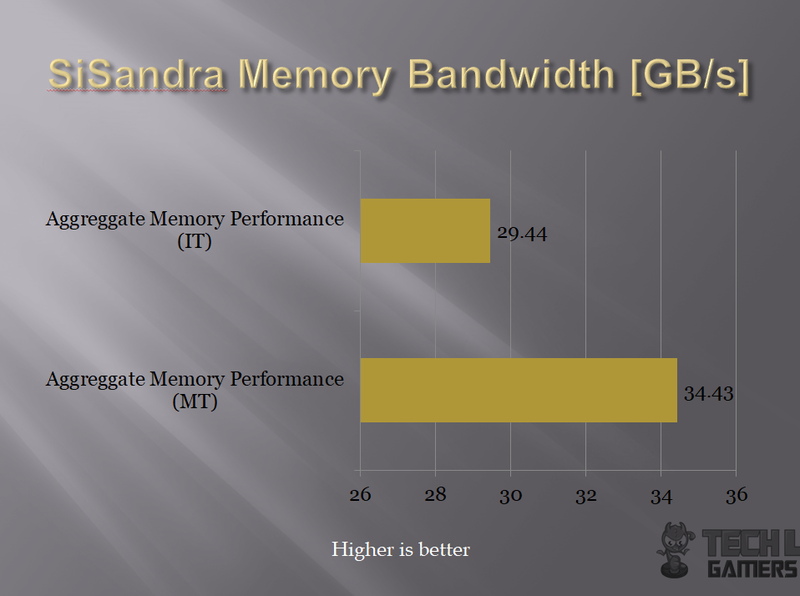 Asus has implemented their own algorithms to enhance the performance of the CPU named as Asus MultiCore Enhancement. DRAM Frequency will be automatically shown to the correct one once XMP is loaded. 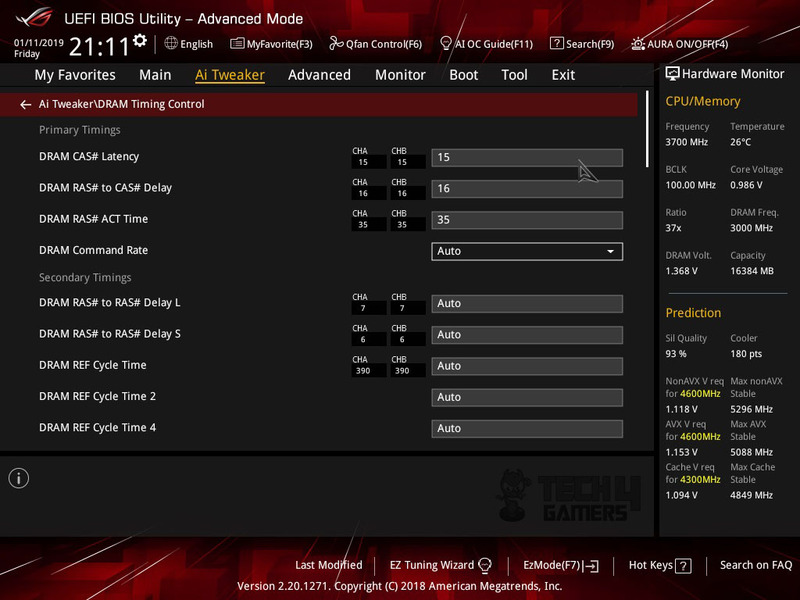 The user can select the frequency from the given list when manually overclocking the DRAM. DRAM Timing Control will let the user to set and control the DRAM timings according to their need. There is a single setting to control the CPU Cache/Core Voltage. 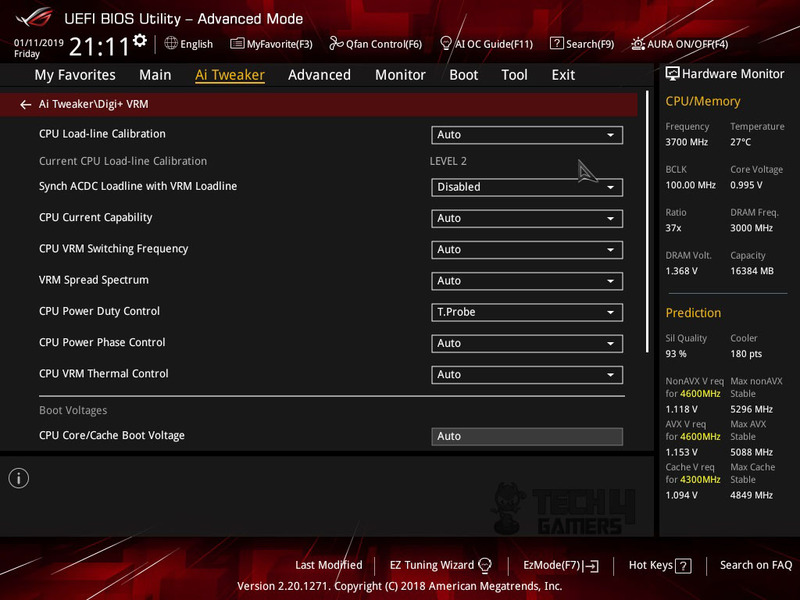 CPU Load Line Calibration and other related settings are in the Digi+ VRM sub-section. 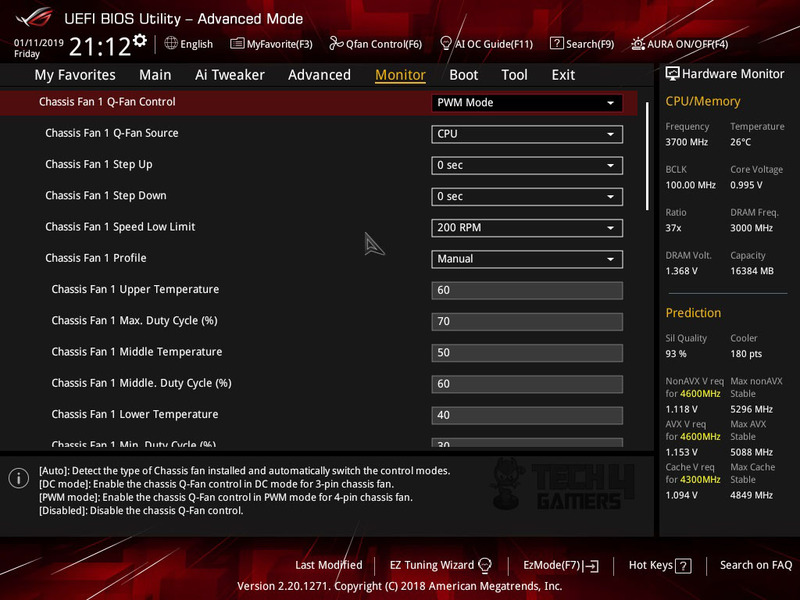 Settings like SpeedStep and Turbo Mode can be accessed in the sub-section named Internal CPU Power Management. Tweaker’s Paradise is for advanced users and should not be disturbed unless you know what you are doing. 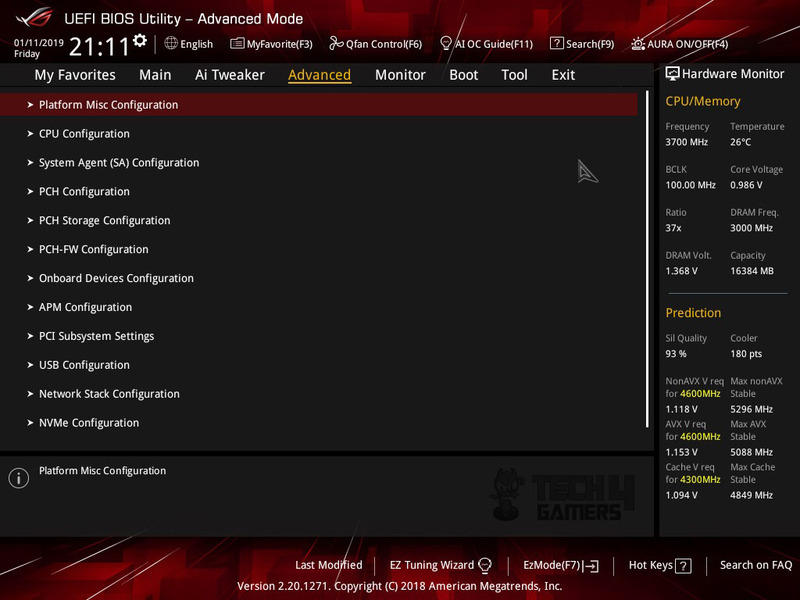 The advanced menu has all other options related to CPU Management, System Agent Configuration, PCH and PCH Storage related options, After Power Management options, USB settings, On-Board devices settings, etc. 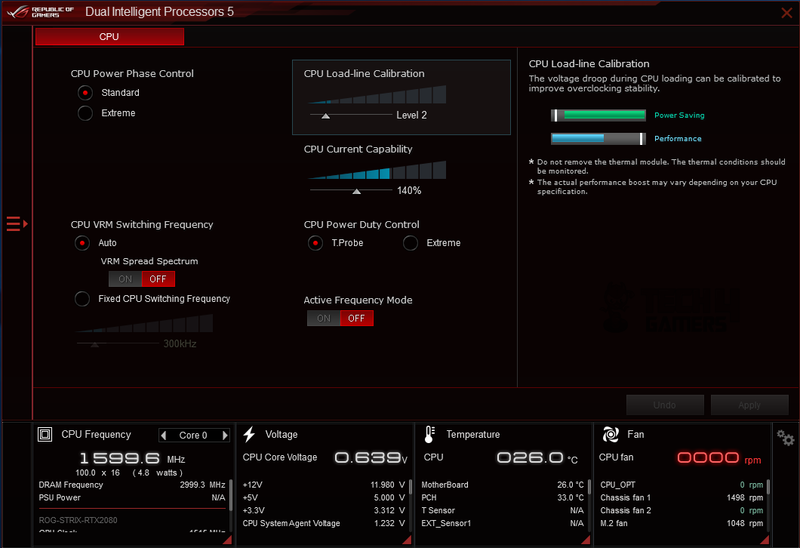 If you want to control the Hyperthreading, no of active cores etc features of the CPU, you can find them under the CPU Configuration option. System Agent Configuration will let you set the Primary Display Adapter and other related settings. 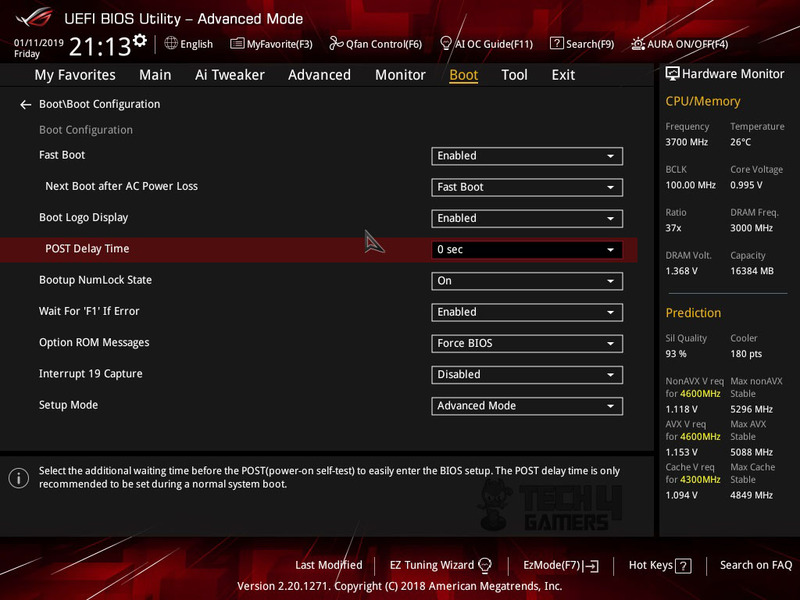 PCH settings will let you change the SATA mode and other related settings. Monitor section will let you see the current temperature of the areas with an integrated thermal sensor as well T_Sensor. 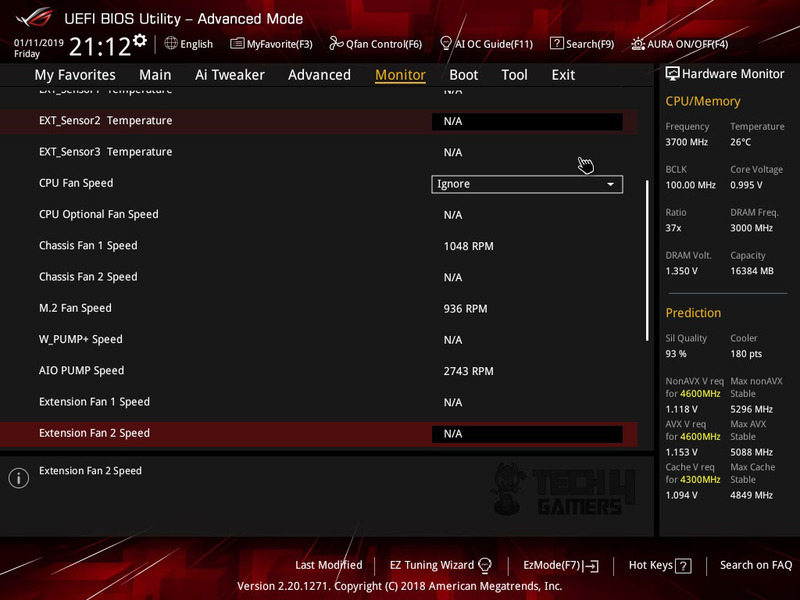 You can also see the RPM of the connected fans and AIO pumps as well as voltages. Chassis Fan headers can be configured independently. The user can change the control type from PWM to DC to Auto. Under the Boot section, you can enable/disable the Fast Boot, Boot Priority, Compatibility Support Module, and other related settings. 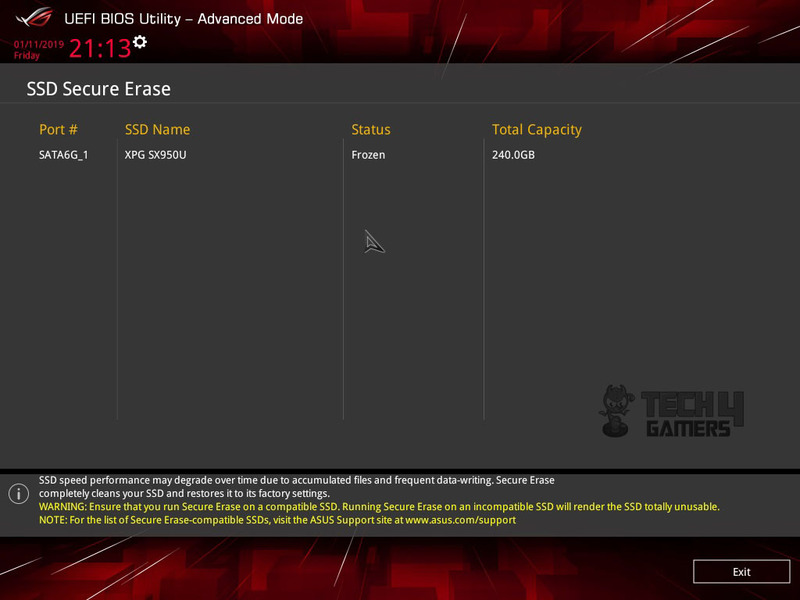 Tool menu has BIOS EZ Flash Utility 3, Secure Erase, Overclocking profile, SPD Info, Graphics Card info. 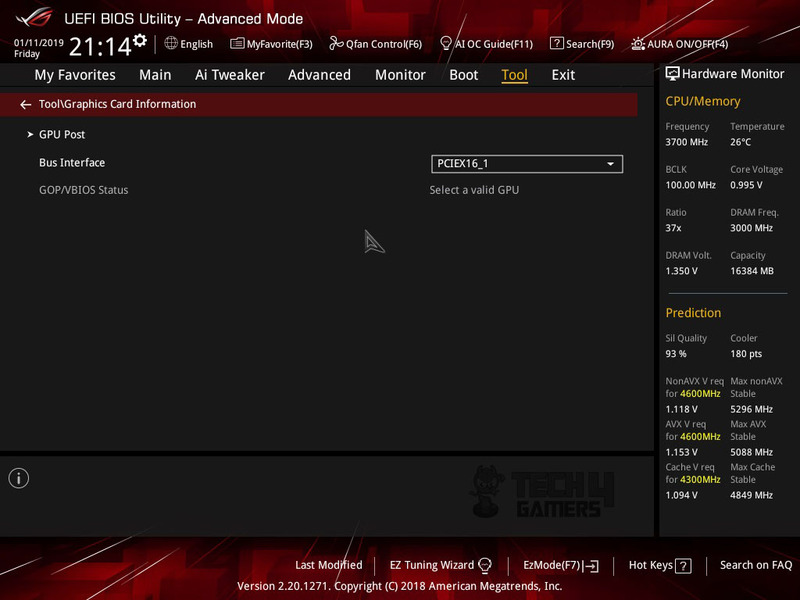 Use the AZ Flash utility in the BIOS to update it. 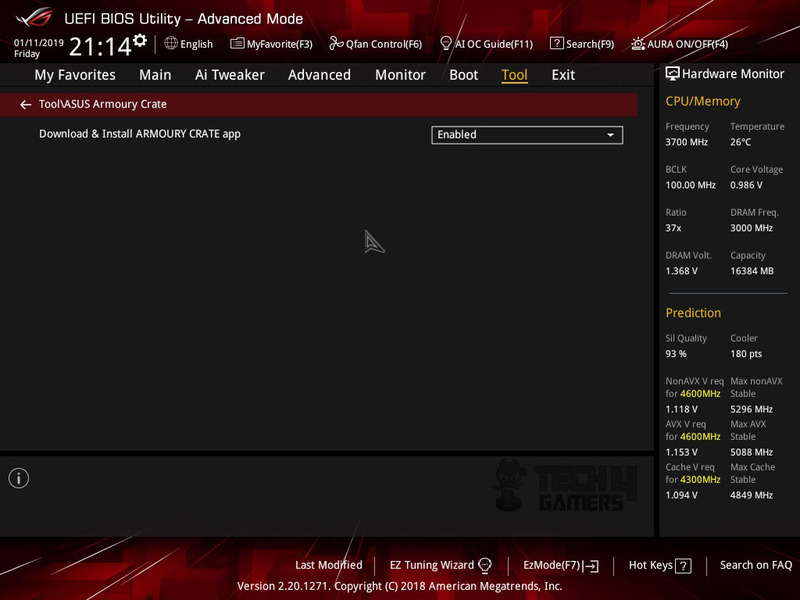 It can even download the BIOS file from the internet and update the BIOS. Updating the BIOS is a risky process and as such should only be done when encountered any issue whose resolution is an updated BIOS. 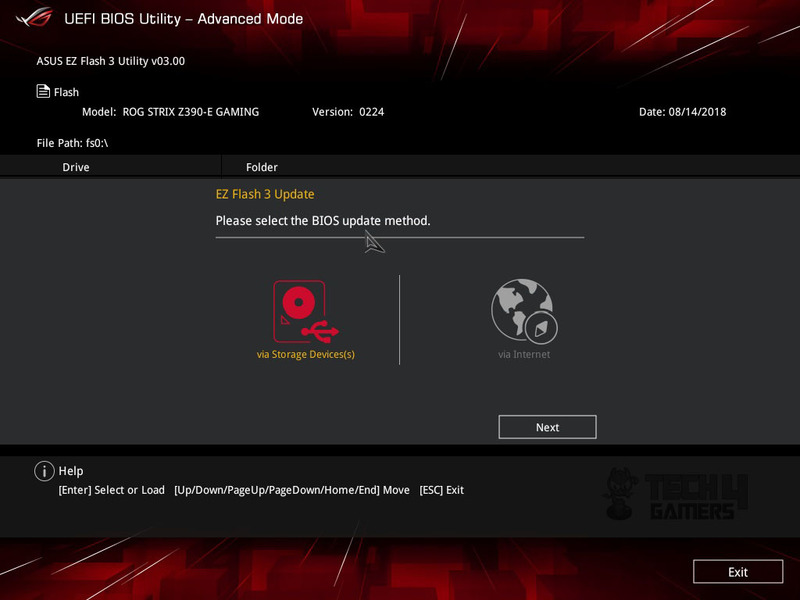 Another way of updating the BIOS is through EZ Update software when in Windows environment. Secure Erase is used to erase the SSD contents and to restore the SSD to factory default. 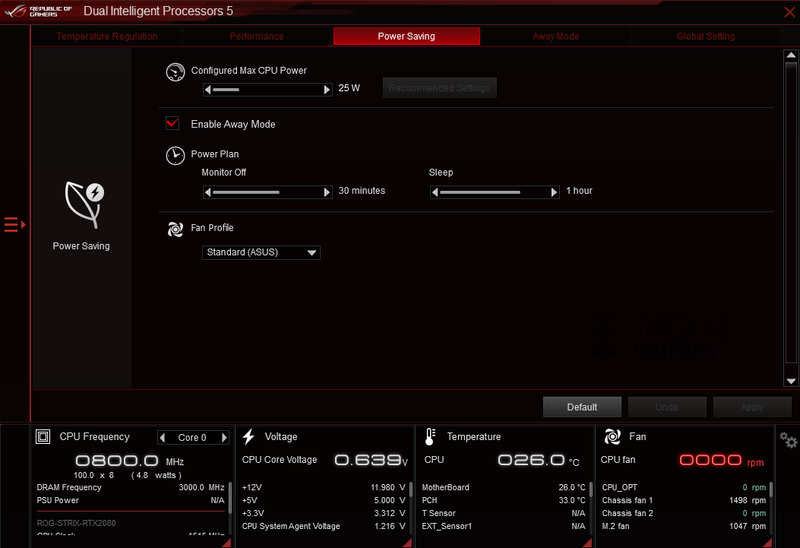 Overclocking Profile helps the user to save several profiles with different settings and to load the saved profile when needed. Up to 8 profiles can be saved. 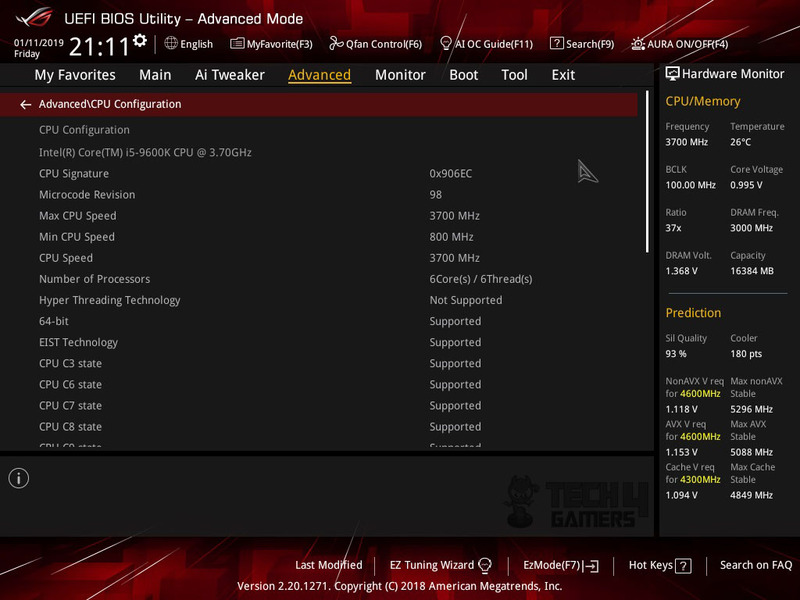 Asus SPD Information shows the DRAM info. 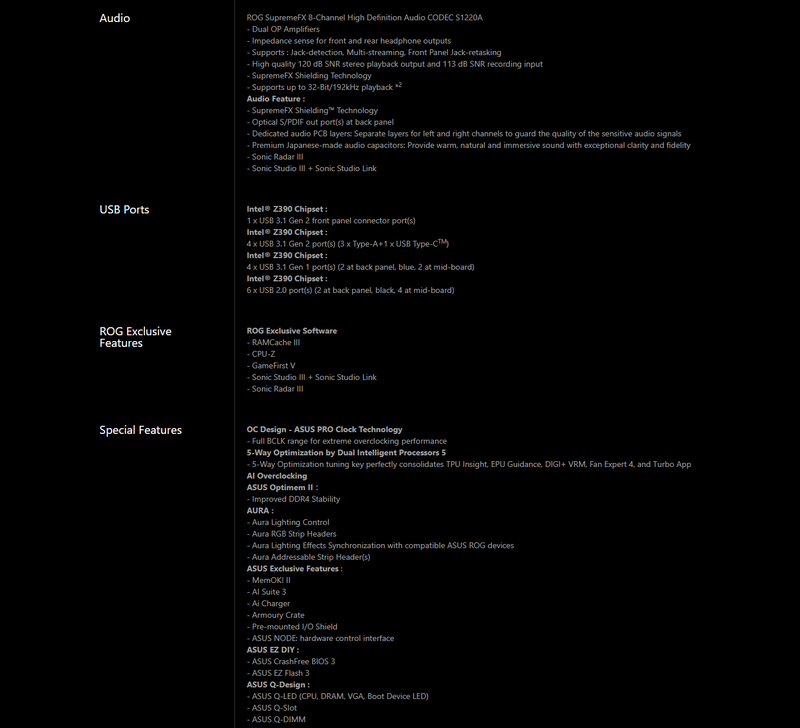 Graphics Card Information shows the info of the installed graphics card. 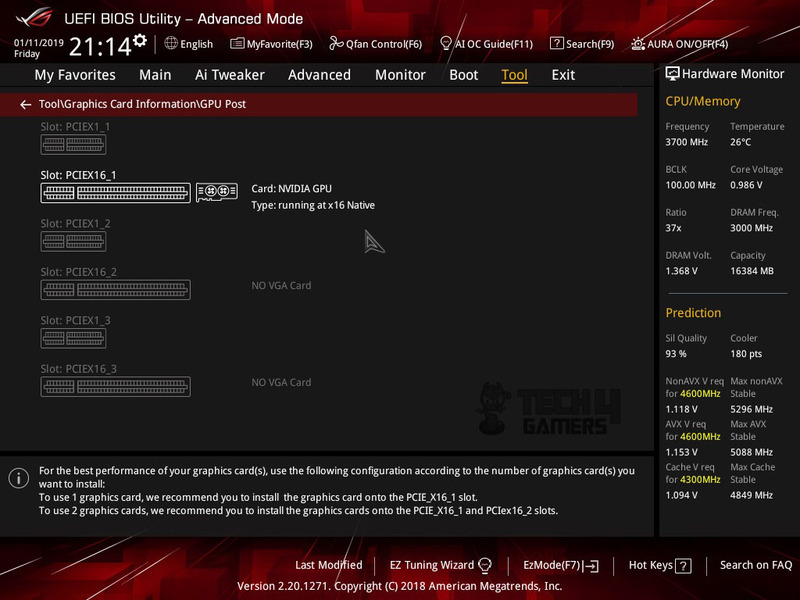 GPU Post will show the graphical interface of the PCIe slots with info on the installed graphics card(s). Exit Menu has related options like Exit without saving, Exit with saving, Load optimized Defaults etc. Pressing F3 will load the Favorites menu where the user can save the most frequently used settings for ease of accessing. Pressing F6 will load Q-Fan Control. The user can create custom fan curve on each fan or group of fans depending upon the implementation of fan headers on the motherboard. Pressing F7 would load the EZ Mode. 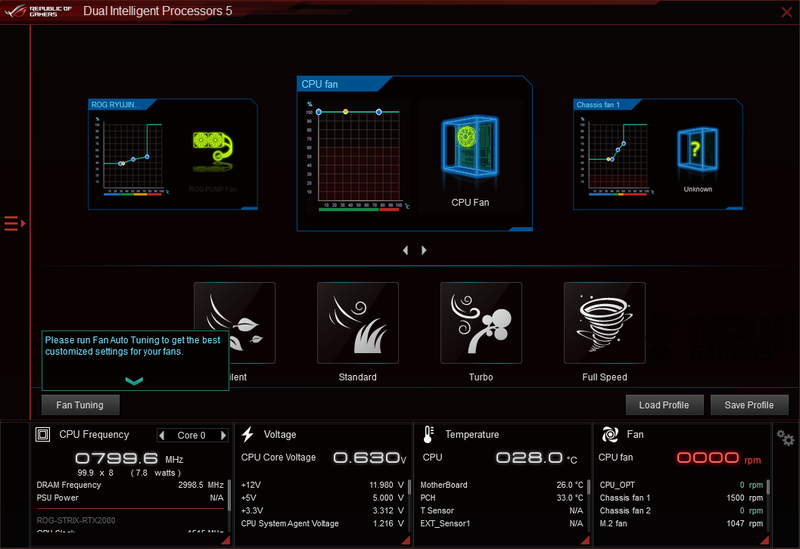 EX Tuning wizard can be used to maximize the performance of the PC depending on the cooling solution being used. 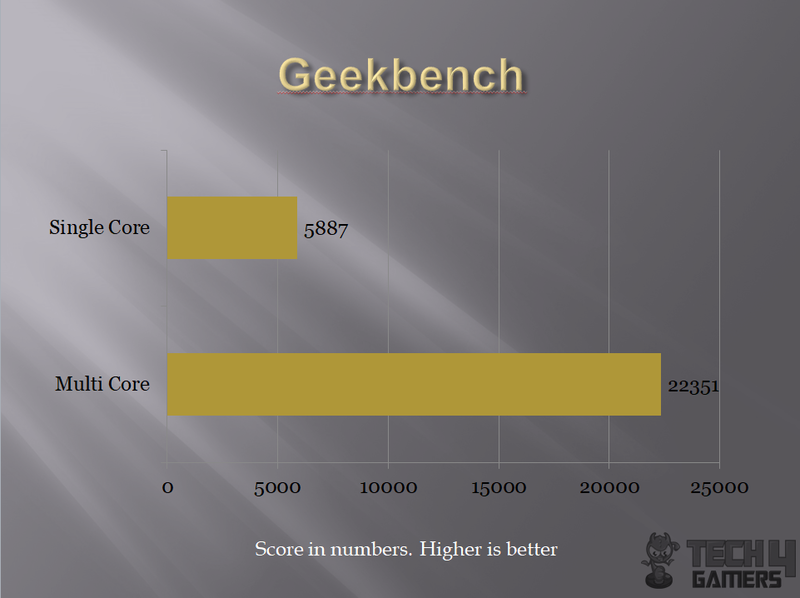 Geekbench 4 measures system’s performance across multiple platforms. 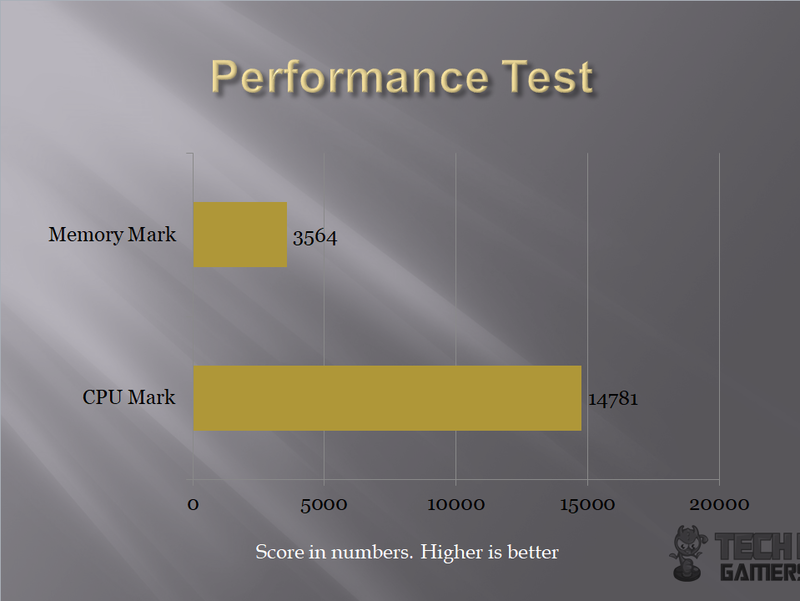 The test build performs well under this test. 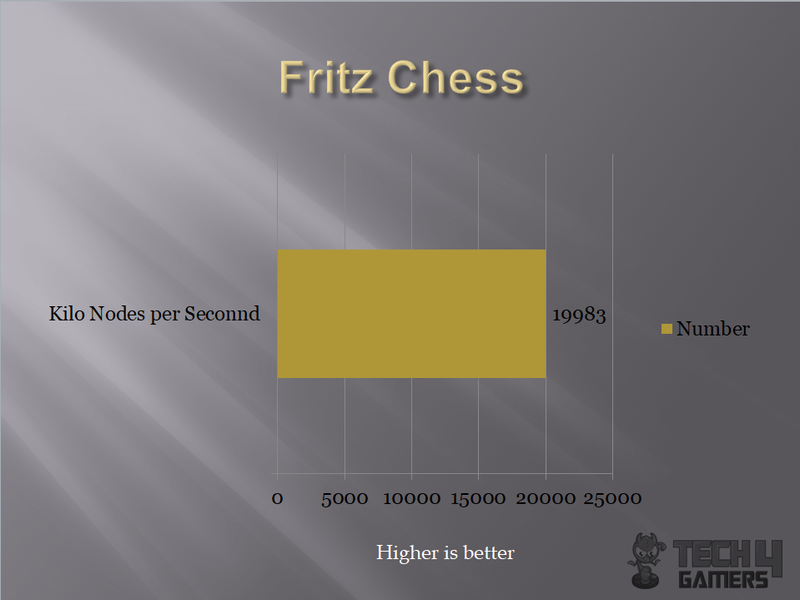 Fritz Chess Benchmark is a CPU Performance test. 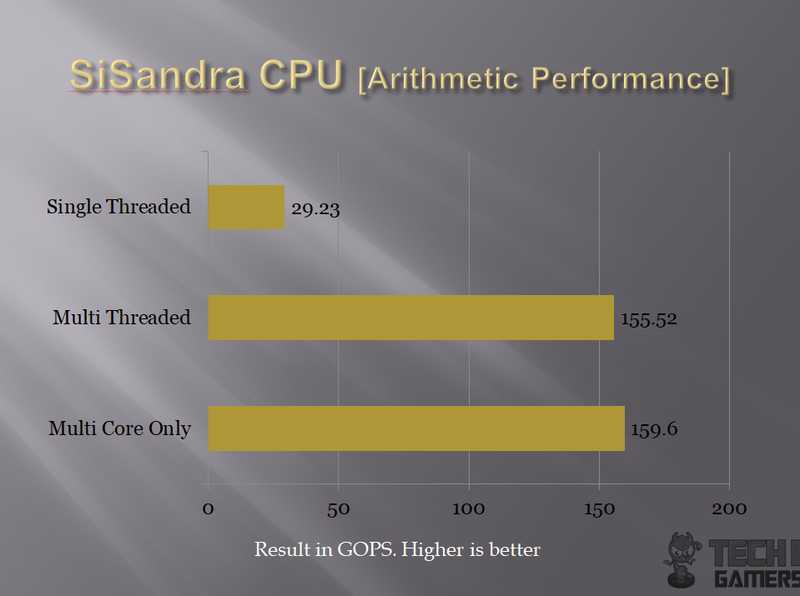 It puts the CPU at 100% utilization and scales among the cores and the threads. The score is recorded as Kilo Nodes per Second and Relative speed. AIDA64 is another extensive application suite to measure the performance and testing the system’s stability. 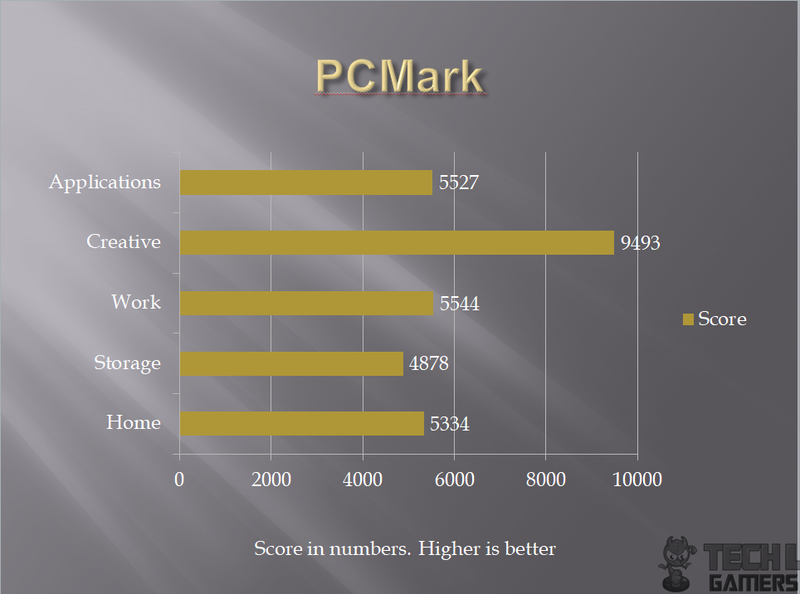 SiSandra is another comprehensive application suite to measure the performance of the various components of the PC and to check for any reported issues with them. 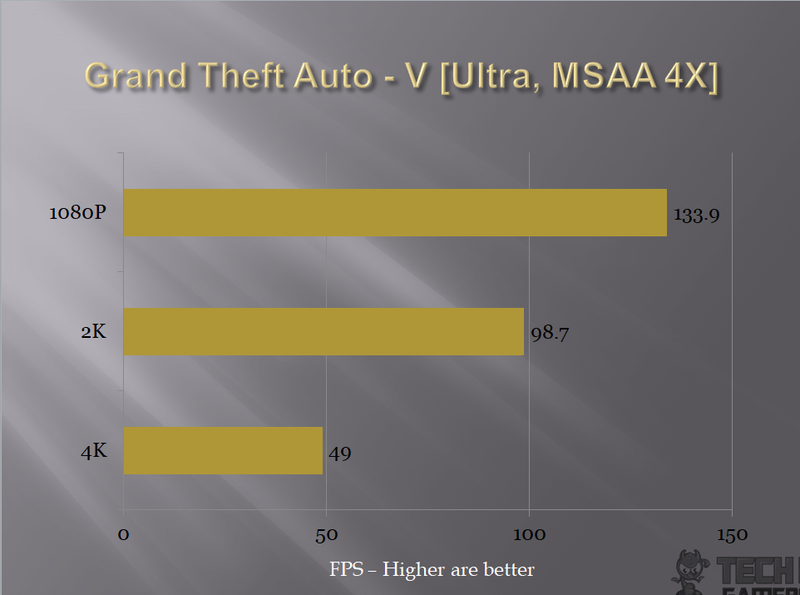 It uses a graphical representation as well as the performance measure. I used it for CPU Performance and Memory bandwidth testing. 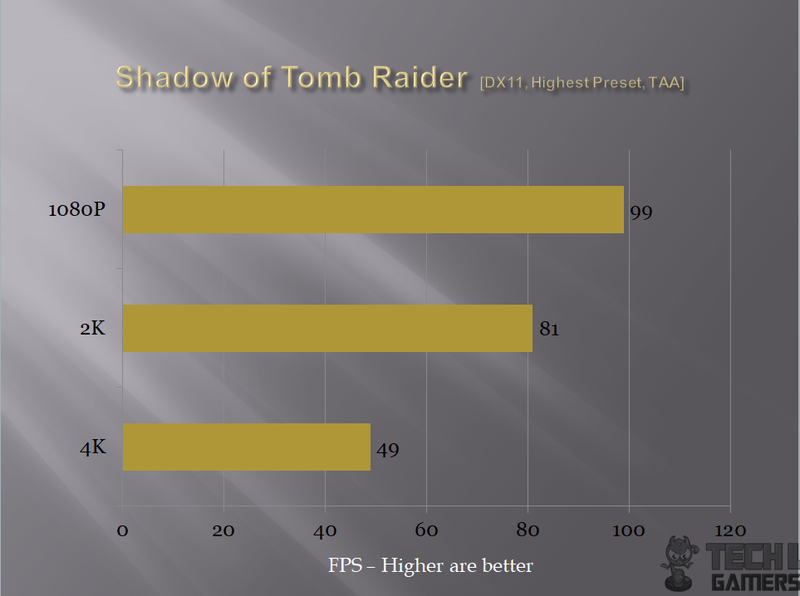 Clearly, Intel Core i5 9600k was bottlenecking on 1080P. 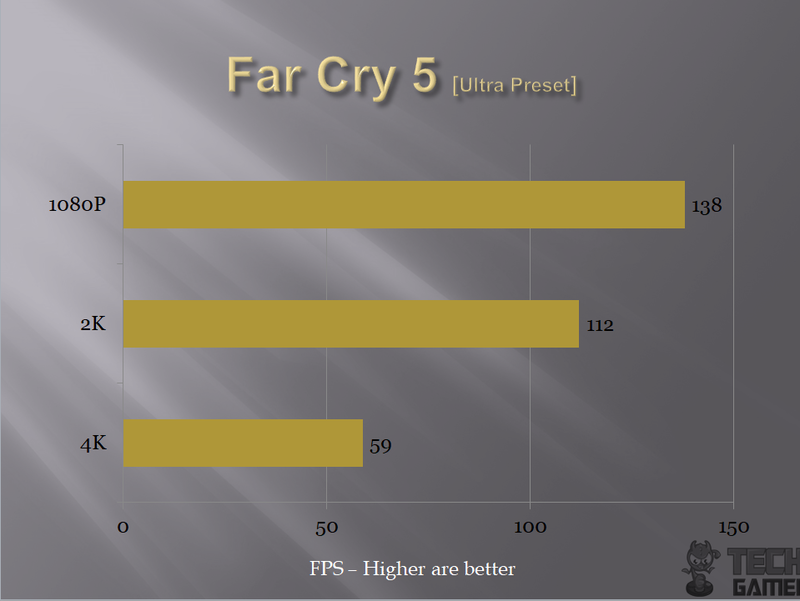 Overclocking the chip resulted in 95 FPS for 1080P. Asus has bundled much software in the provided disk. We’ll discuss AiSuite here as it is the main software when it comes to getting the best of the best performance and fine-tuning. 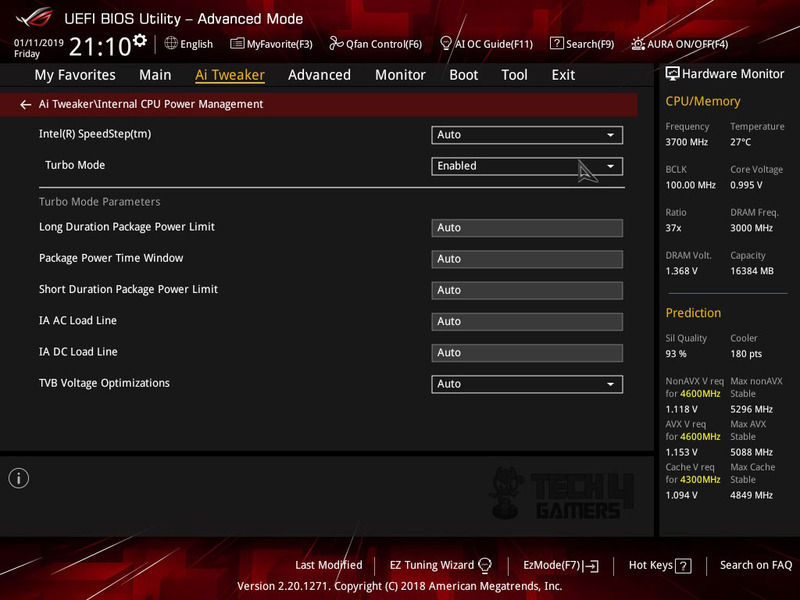 The user can use this software to do literally anything ranging from overclocking to controlling fans to updating software and BIOS etc. Unfortunately, this software is still as buggy as it was before to the extent that it was providing incorrect CPU temperature and was interfering with the BIOS settings continuously. 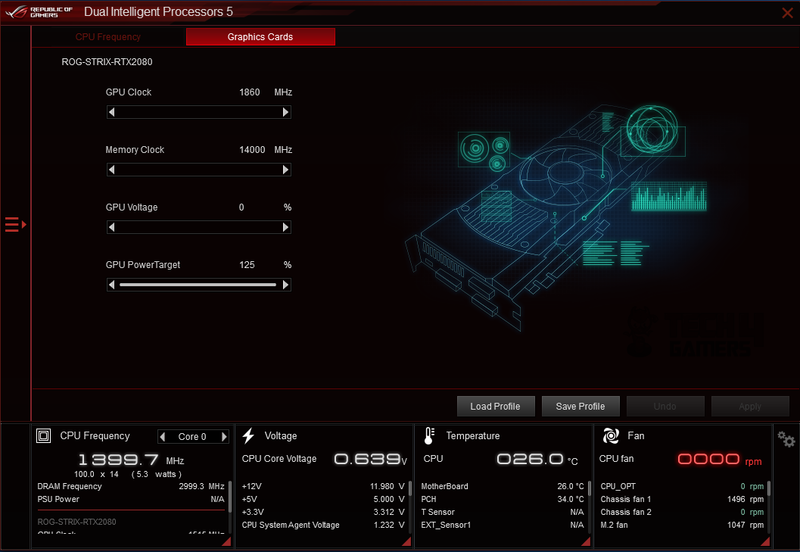 The main interface has Ai Overclocking option on the top left side. 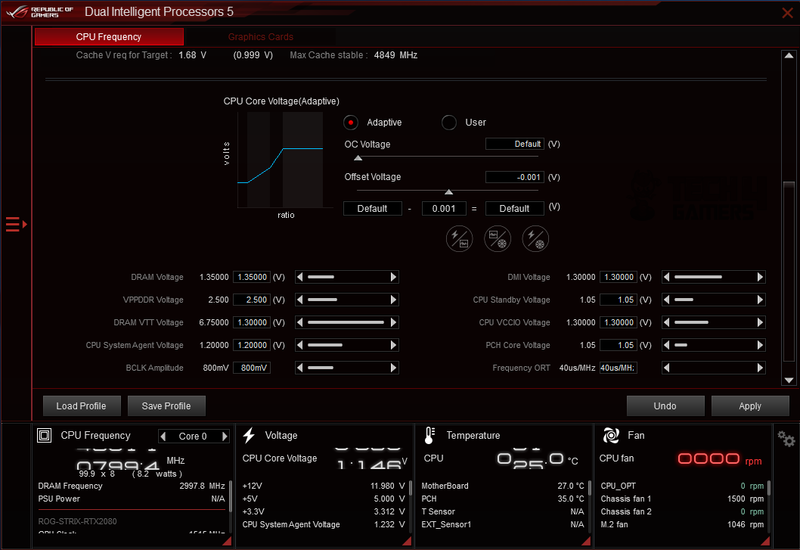 Clicking it with start a wizard that will determine the cooling potential of the cooling solution and chips’ ability to overclock to its max given the thermal characteristics etc and will start an attempt to overclock the system using the AI predictor. The predictor is just an estimate and not an exact figure. Frequency, Voltage, and Cooling are three parameters which the AI Overclocking is rounding about. Clicking on 5-Way Optimization will launch settings forms showing various configurations and options to the user before starting the Wizard to try overclocking the system based on the user input. 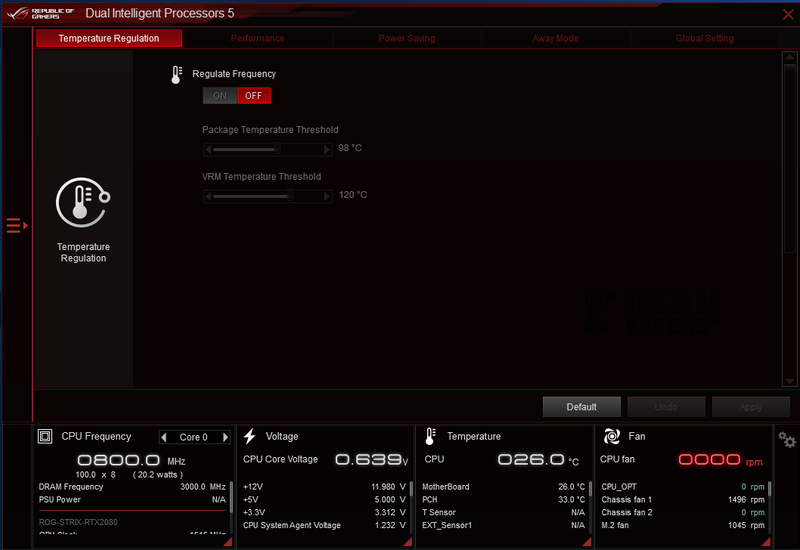 The wizard will overclock the CPU frequency with 100MHz at a time with stress test of 15 Seconds or user provided value on each iteration to determine the thermal characteristics and stability. The system will restart several times during the process. The process is fully automatic and user intervention is not needed. Each iteration shows the summary of the process in terms of Current-Voltage, Temperature, and Power in addition to the Maximum values of each variable. Once the complete process is done, Summary will be produced. Clicking on EPU Guidance will launch new interface showing the power profiles namely: Performance, Power Saving, and Away Mode. Away Mode is a more tightened version of the Power Saving mode. We’ve TPU, Fan Xpert and Digi VRM summaries on the main section. Turbo App status and EPU settings are on the right side of the main section. 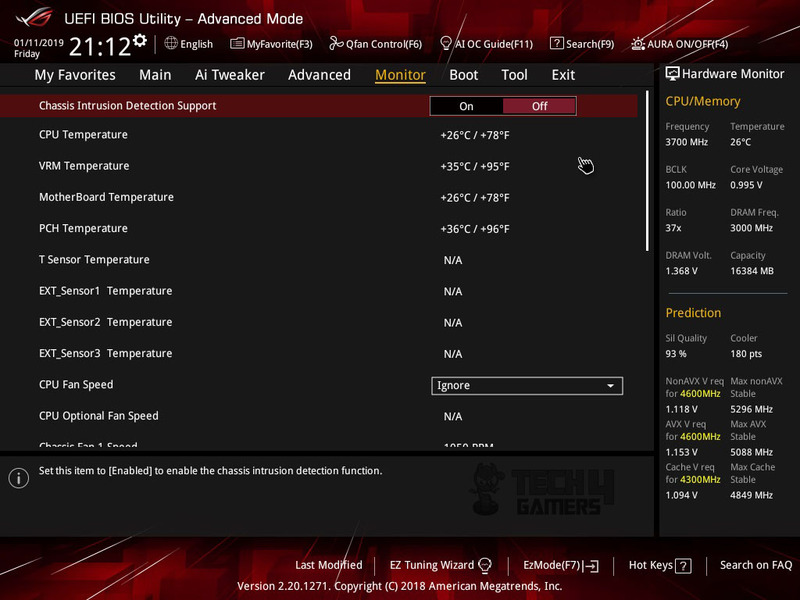 CPU Frequency, Voltages, Temperatures, and Fan speeds are mentioned on the status bar located at the bottom of the interface. Clicking on the three bars and an arrow indicator on the leftmost side will open the menu list of the software. We’ve TPU, EPU, Digi+ VRM, Fan Xpert, PC Cleaner, EZ Update etc on the listing. Fan Xpert is a very handy tool and it can be used to configure each and every fan in the Chassis as per the user requirement. If you are not sure about the settings to be used then simply run the Fan Xpert Fan tuning wizard. The wizard will check the characteristics of each fan and set the profile accordingly. There are 4 pre-built profiles for the fans which are Silent, Standard, Turbo and Full speed. The graphical interface is available as well to set the fan curve. There are two modes, smart Mode with custom fan curve and RPM Fixed Mode which will set the one constant speed for the selected fan. 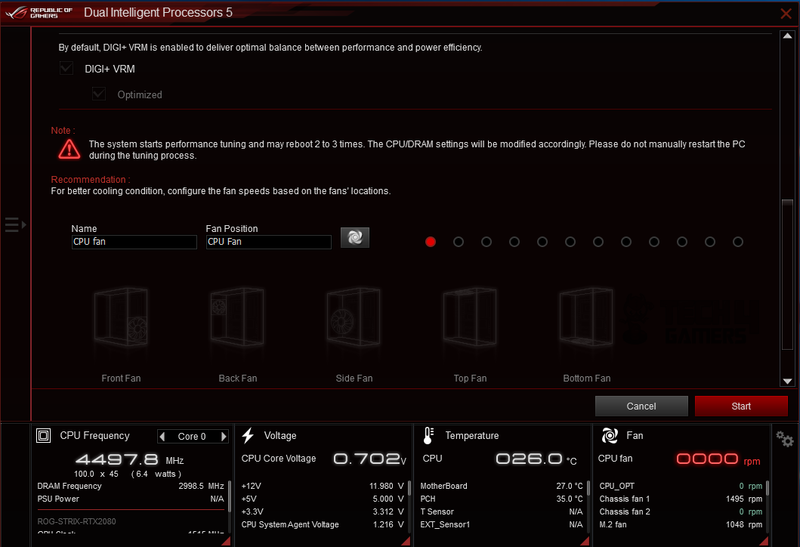 TPU section provides comprehensive settings to overclock the CPU. We have the option of fine tuning single core or group of cores. Voltage can be set as Adaptive, offset or User where User means the manual Vcore. Digi+ VRM section contains settings like CPU Load Line Calibration, VRM Switching Frequency, CPU Power Phase control etc. 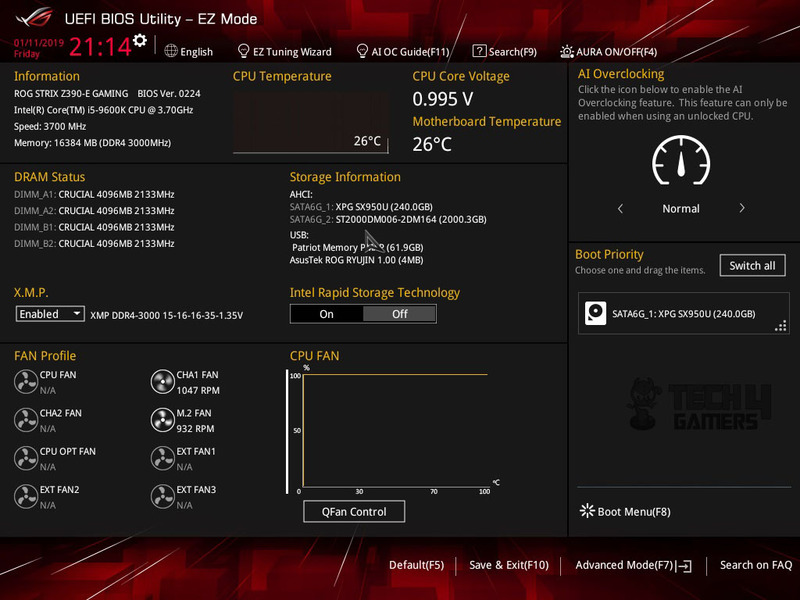 System Information shows the Motherboard, CPU and DRAM information. Turbo App boosts the performance of selected applications. PC Cleaner lets the user to get rid of junk files and to free the space taken by these files. For the purpose of to the point testing, we disabled the Asus tweaking and Core enhancement to stay with the Intel defaults. The SVID plays an important role and it impacts the overclocking if every setting particularly the Voltages are left at Auto with only core values are set by the user. 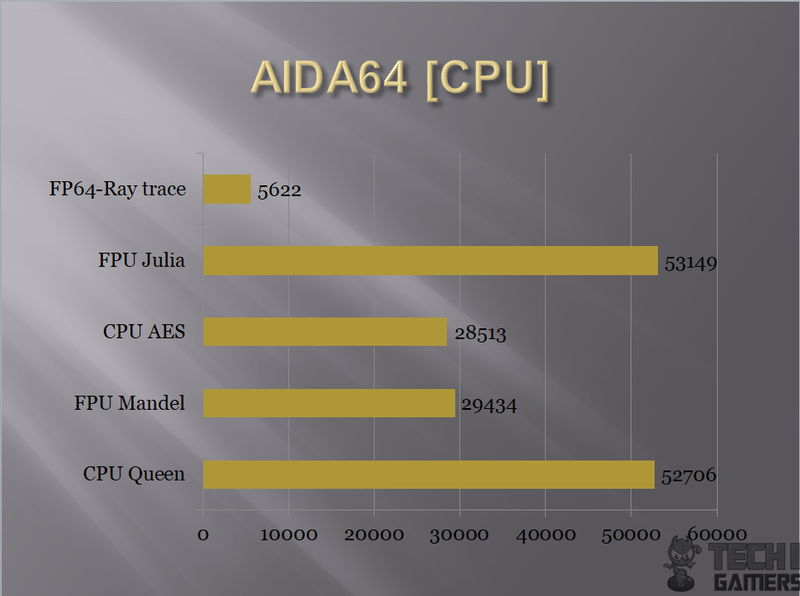 AIDA64 Extreme was used to stress the CPU (CPU, FPU, Cache, System Memory). HWInfo 64 was used to take notes of the power consumption. On stock clocks, the chip was boosting to 4.4GHz using 1.000V VCore. 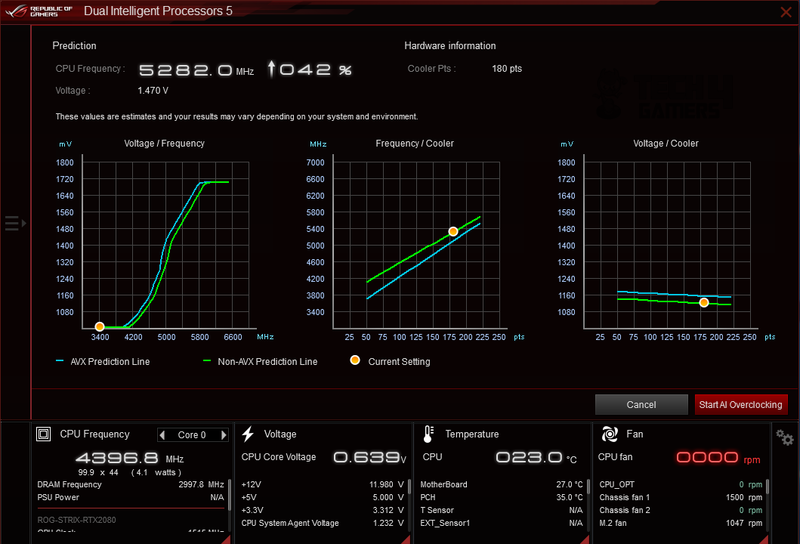 The power consumption of the chip was 64.506W with the system drawing power of 157.760W under load. The maximum temperature while gaming was 47°C whereas it was 50°C while encoding using the Handbrake. 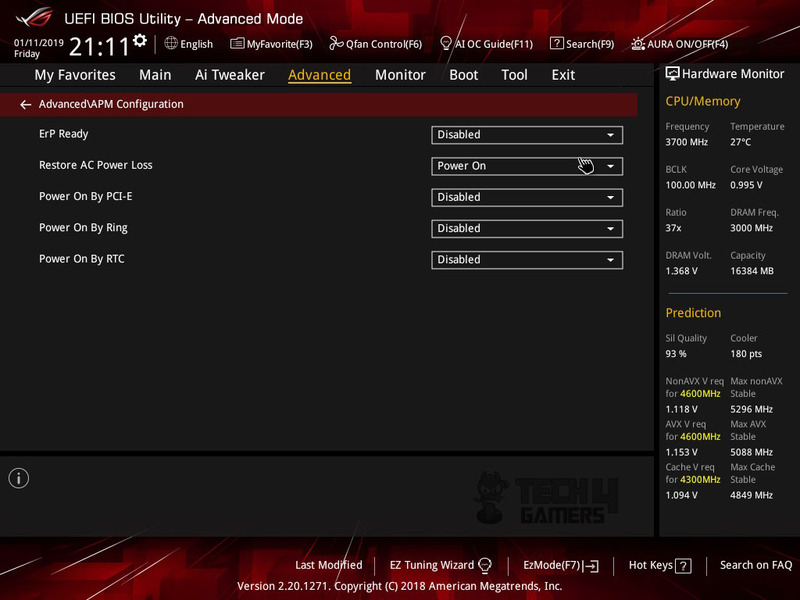 Chip overclocked to the 5.1GHz using 1.430V VCore. 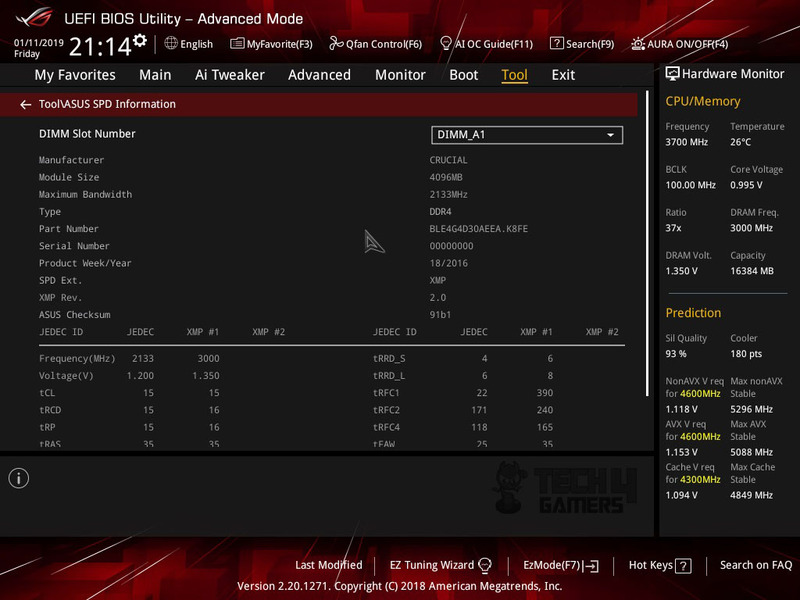 It was a stable overclock and Asus Ryujin 360 kept the chip within check with an average temperature of 74.33°C under stress test with maximum temperature on any core was 77°C. For me, this chip is hot as the ambient was 18°C. The chip used 1.335V for the 5.0GHz clocks and average temperature under stress at 5.0GHz was 64.5°C. The power consumption of the chip at 5.1GHz under load was 140.052W and that of the system was 249.369W. Please, note that during the testing only CPU was put under load. The graphics card was idling all the time. CPU’s power consumption is as reported by the HWInfo 64 under the CPU Package Power parameter. 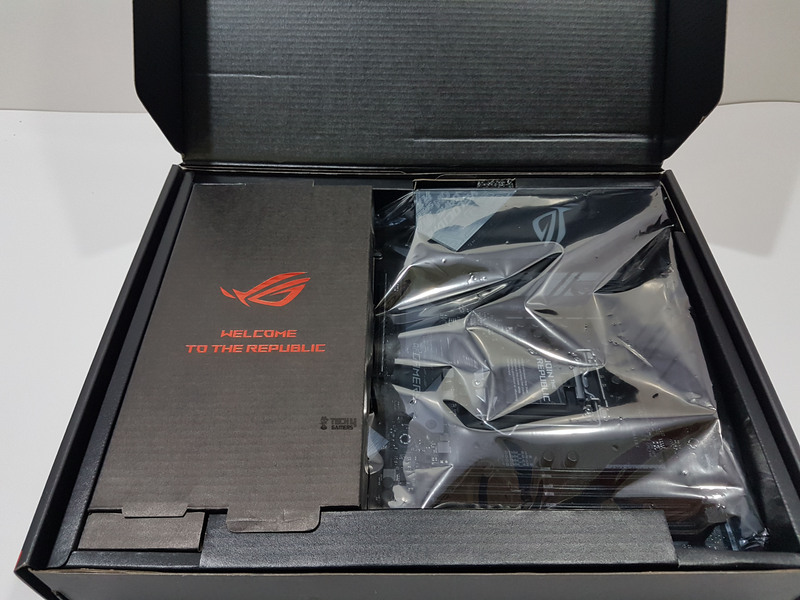 Asus is not an unknown quantity in the market of PC Components and Peripherals and their ROG (Republic of Gamers) brand has earned them the respect and trust from the gamers and they have truly created a republic in which every Asus user is welcome. 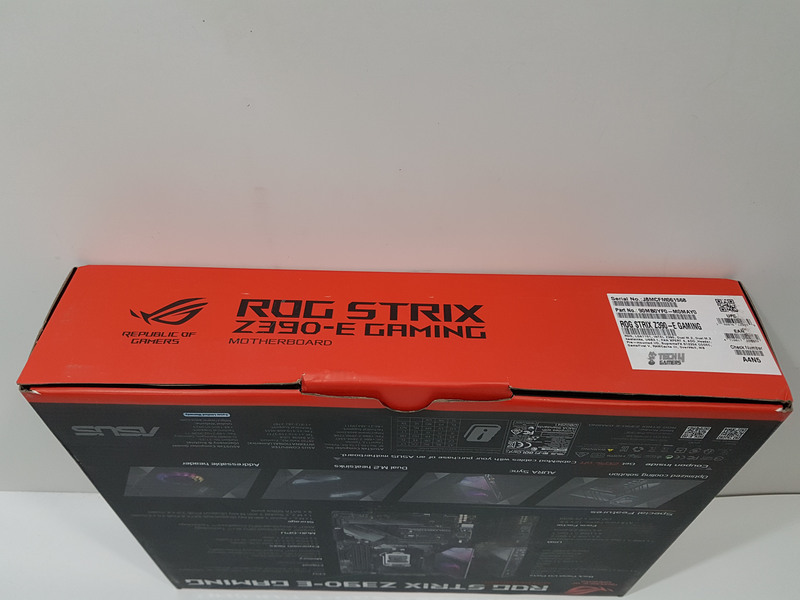 ROG being their premium brand, Asus created Strix brand to target the middle market segment. 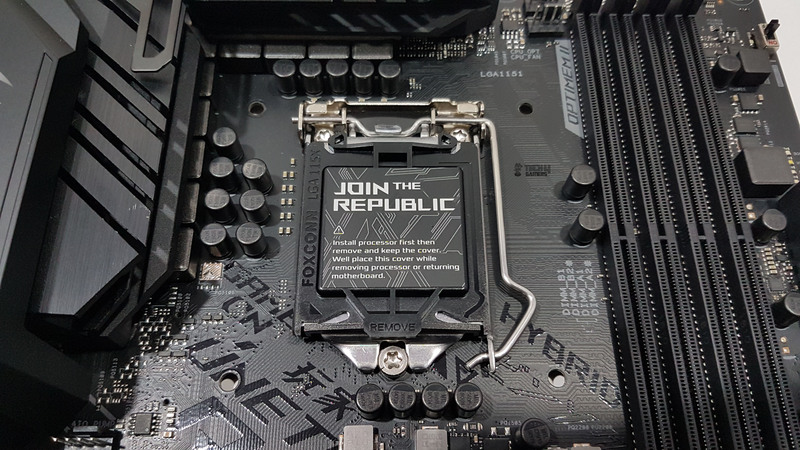 Later on, they merged the Strix under the ROG branding giving the Strix users a sense of accomplishment for still being a part of the Republic. Asus ROG and ROG Strix line up of motherboards are feature-rich with performance punch packed inside. Asus Strix Z390-E Gaming motherboard is the high-end offering in the ROG Strix lineup. 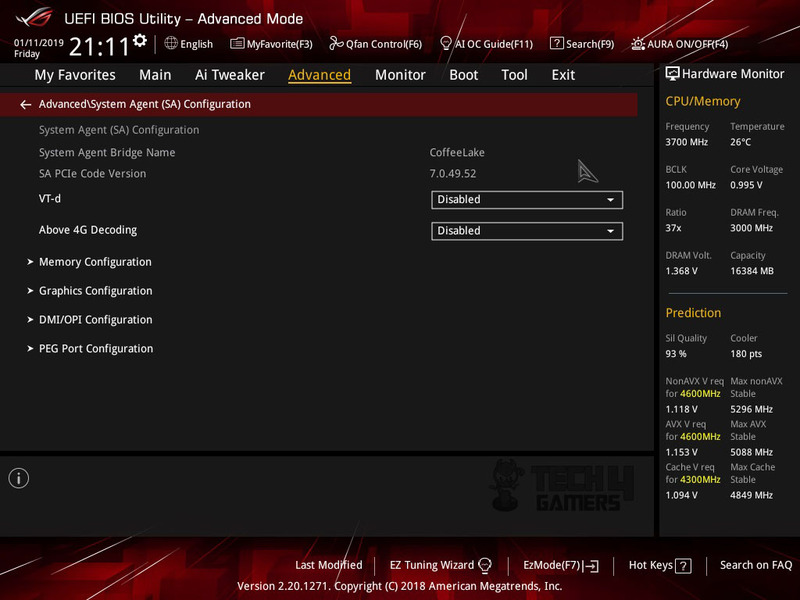 As is the case with the other models, this motherboard features the same intuitive UEFI BIOS with user-friendly interface and easy to navigate through the menus. 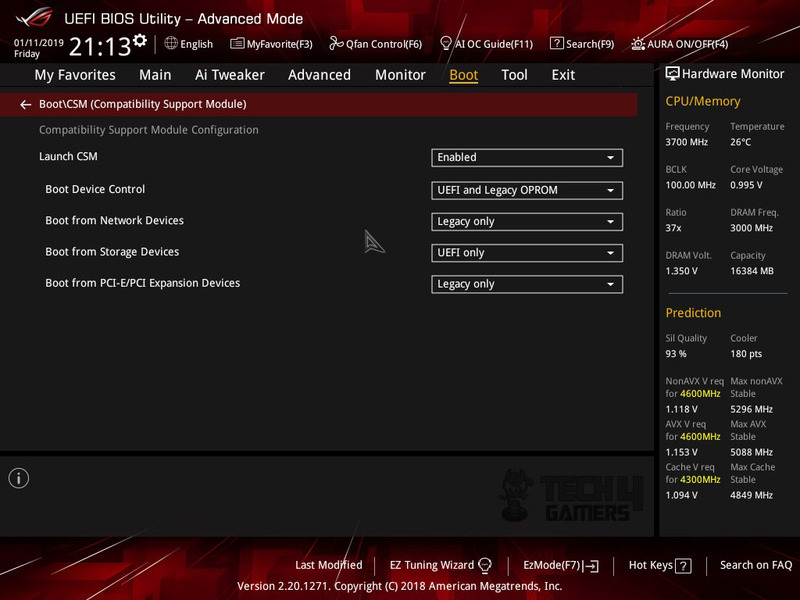 BIOS is also feature-rich for novice and experienced users and has many functions like creating custom fan curve profile for each fan, taking picture of the BIOS screen and saving it to the USB Flash drive, Securely erasing the SSD, updating the BIOS from the Internet, GPU post to name a few. 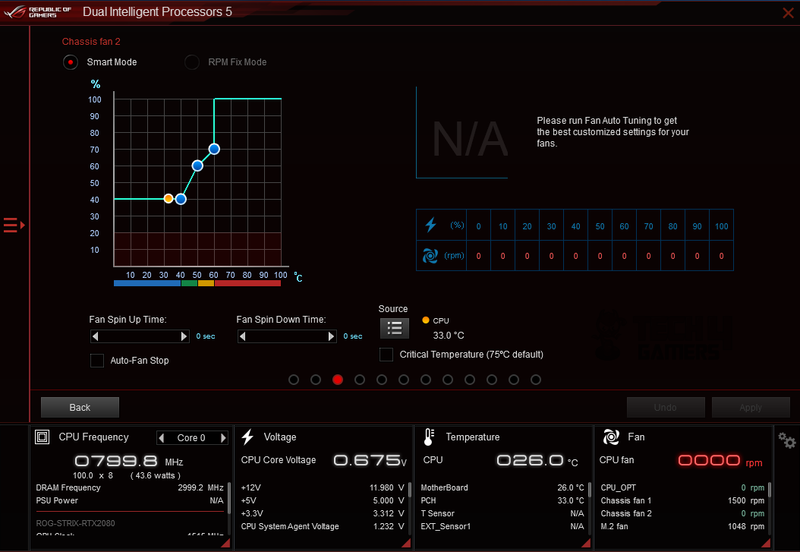 AI Overclocking is something new and fun to tinker with. 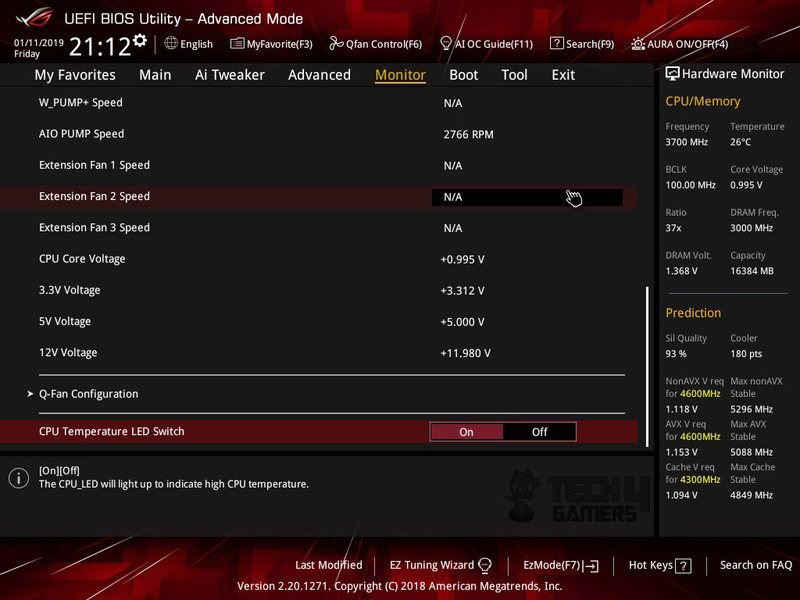 Of course, it is needless to say that overclocking features are full of cream giving full control over every aspect of the motherboard and the CPU for the experienced user. This motherboard has Intel LGA-1151 socket with support for Intel Core processors in 8th and 9th generations. Just a reminder that despite being an LGA-1151 socket, it does not support the KabyLake/SkyLake CPUs. This motherboard has 4 DIMM slots supporting only DDR4 DRAM modules with a maximum of 64GB capacity and 4266MHz (OC) DRAM speed. 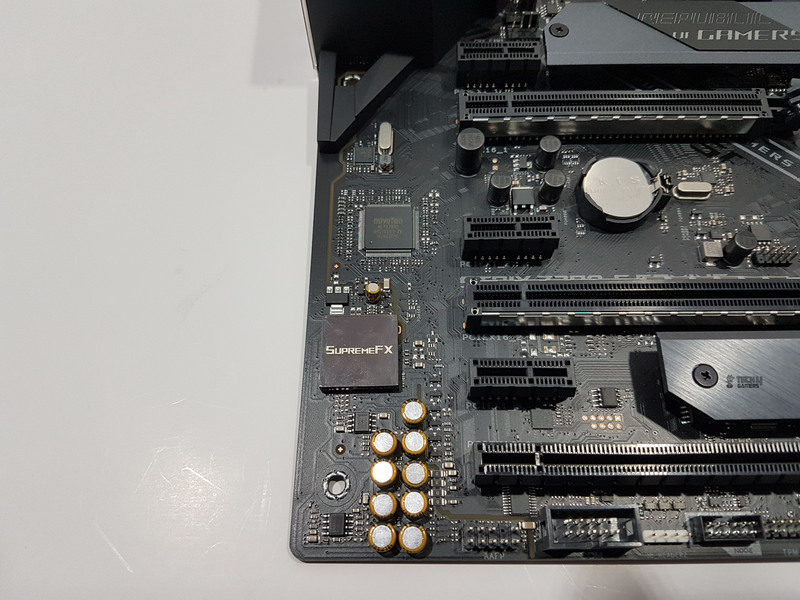 This motherboard has total 7 PCIe Gen 3 slots with 3 of them being PCIe X1 rated, one is x16 rated which is electrically implemented and drawing PCIe lanes from the CPU. The other PCIe slot is X8 rated. In case of two way SLI or CrossFire X the X16 slot will operate at X8 speed. In terms of storage, this motherboard has a total of 6 SATA 6G ports from Intel Z390 chipset. It has two M.2 Sockets. They are socket 3 with M key type 2242/2260/2280 storage devices using PCIe x4 and SATA. The other socket is with M key type 2242/2260/2280/22110 using PCIe mode. Speaking of USB ports, we have 6 USB 3.1 Gen 2 ports coming from the Intel Z390 chipset. We also have a USB 3.1 Gen 2 port and a USB 3.1 Gen 1 ports coming from ASMedia controller. This board is Intel Optane Memory ready. The M.2 sockets have beautifully designed aluminum heatsink covers with the pre-mounted thermal pad. 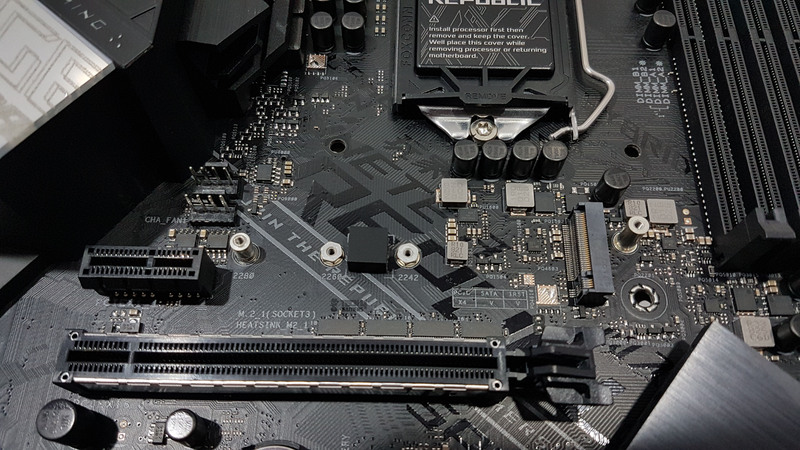 Speaking of the cooling solution, we have 5 4-pin PWM fan headers on this motherboard with a dedicated AIO_Pump and W_PUMP+ headers which are also 4-pin. In case you feel like short of fan headers there is also a 5-pin Fan Extension header on this motherboard. The user can buy optional Fan Extension Hub accessory from Asus to be used with this motherboard. Up to 3x 4-pin PWM fans and 2 thermal sensors can be connected on this hub. The hub draws power through SATA connector. There is T_Sensor connector to connect thermistor cable with it. 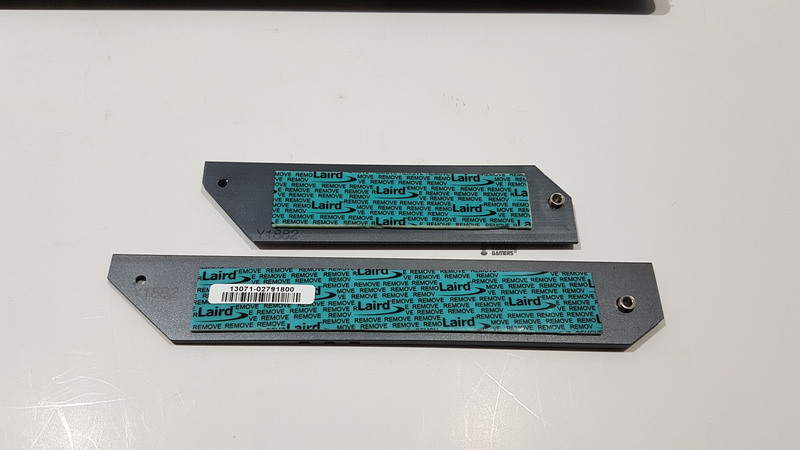 We have two AURA headers with +12V/G/R/B format and an addressable header with +5V/D//G format. There is a single lighting zone on this motherboard which is located on the rear I/O panel’s shroud. There are two aluminum made heatsink covers on the VRM and MOSFETs. It has a TPM connector, Serial Com connector, and front panel audio connector as well. There is no Q-Debug LED on this motherboard. There are 4 LEDs on the right side of the PCB with each LED corresponding to Boot, VGA, DRAM, and CPU. In case of any issue, the corresponding LED remains lit. It features Intel 1219V Gb LAN using LANGuard and GameFirst IV. It features SupremeFX S1220A Codec using ES9023P High Definition DAC with 120dB SNR stereo playback and 113dB SNR recording input. Sonic Studio III and Sonic Radar III are bundled software to augment the hardware functionality. The board is mentioned to have 8+2 power phases. This motherboard has 2×2 WiFi module with stylishly designed antenna in Asus branding. This WiFi implementation is supporting a/b/g/n/ac and supports dual-band frequency 2.4/5GHz with MU-MIMO. The motherboard carries a limited 3 years warranty. Our experience with the motherboard has been nice. The first boot was a success. 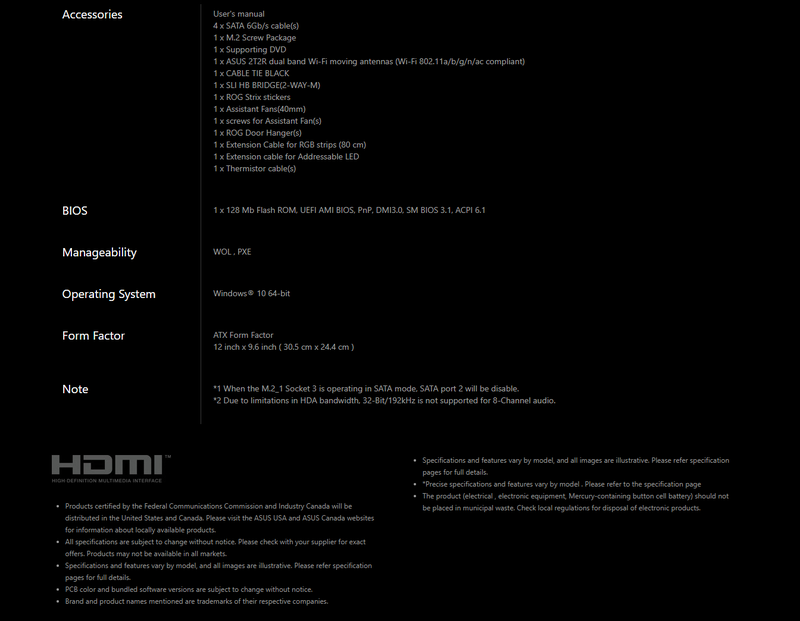 The BIOS has no glitch and has a user-friendly interface. The Asus users would not find anything different in the layout making the life easier for the user. I was susceptible regarding the VRMs and the ability of the board to sustain stable overclock but it does allow Intel i5 9600k to overclock to 5.1GHz without any glitch. 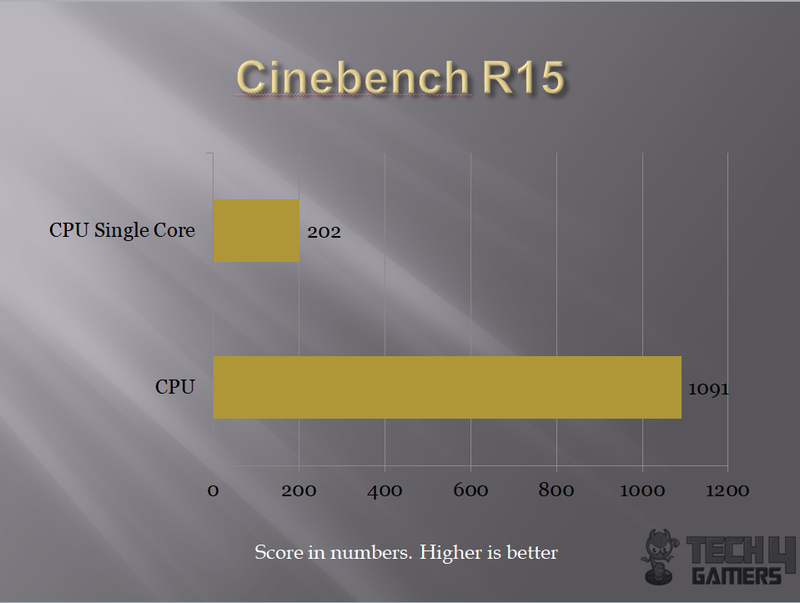 Same was the case with the Intel i7 8700k which was overclocked to 5.1GHz and board was able to sustain the overclock. The killer lighting effects speak for themselves and futuristic cyber fusion adds the stunning looks. This motherboard comes recommended by us though, given the set of features and performance, the local price is bit steep. 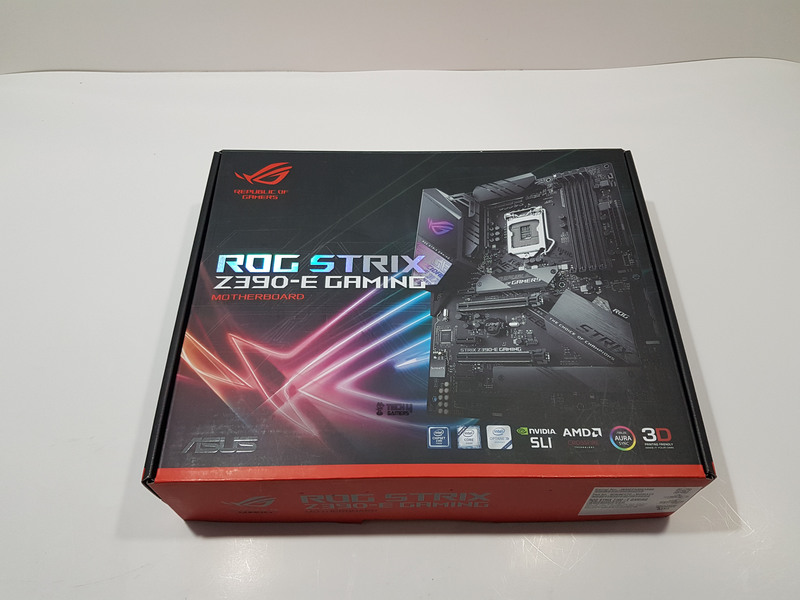 We are thankful to Asus for giving us the opportunity to review their ROG Strix Z390-E Gaming motherboard.